The following is a list of all entries from the SAMFA category. 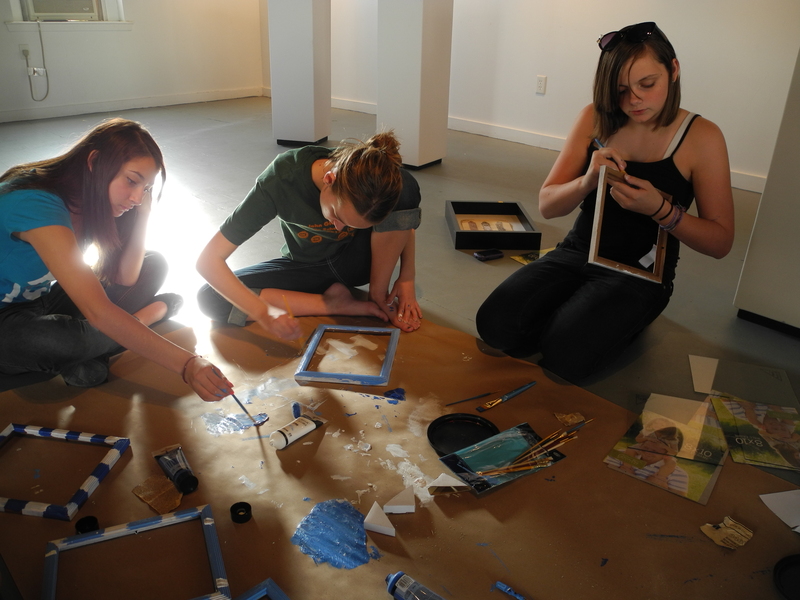 This week Aqua Squad is working on their photography exhibition! Painting, mounting labels and organizing their photographs takes a lot of effort–but it’s fun! 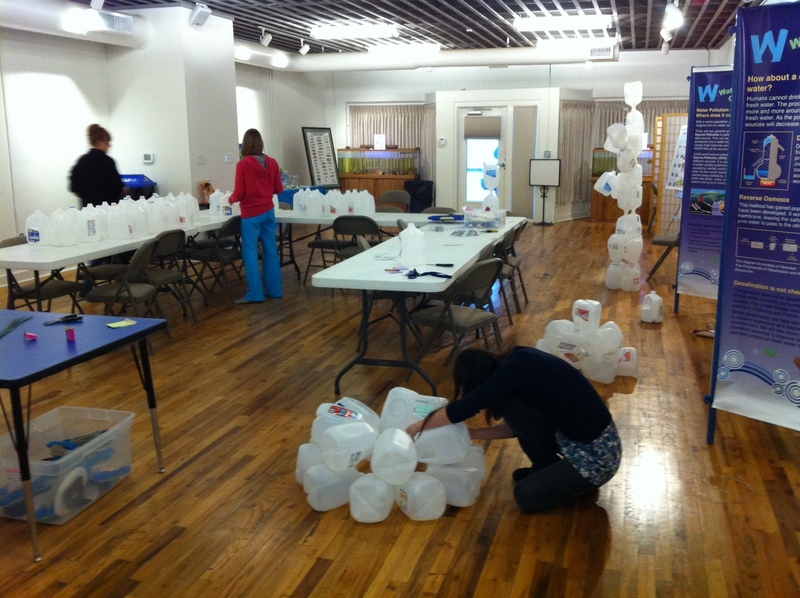 Hopefully this exhibit will bring the community together to talk about the important issue of water. Join us October 18th at 6 PM for refreshments, great photography and a chance to find out what you can do to help our River. Check out what we’re up to below. Also, here are some of the artworks we looked at for inspiration. And finally, we have a poll for your students! Check it out below. Also, please feel free to share thoughts, ideas or activities your students are doing in the classroom that connect to Where in the World is Nature! Here’s a quick video Andreas took of Dr. Ryder revealing the Frozen Zoo in San Diego! Aqua Squad is gearing up to present to the community about our water issues! Join us at Eco Fair on October 13th to learn about what YOU can do to save San Angelo’s water. Also, join us October 13th at Eco Fair at the San Angelo Museum of Fine Arts (1 Love Street) to find out what you can do to save San Angelo water! AND, don’t forget our art exhibition opening on October 18th at 6 PM. The show is called Crisis in the Concho, and it features all the photos we took over the summer. When did trashcans become trash? Is any of this yours? Looking for trash along the river. 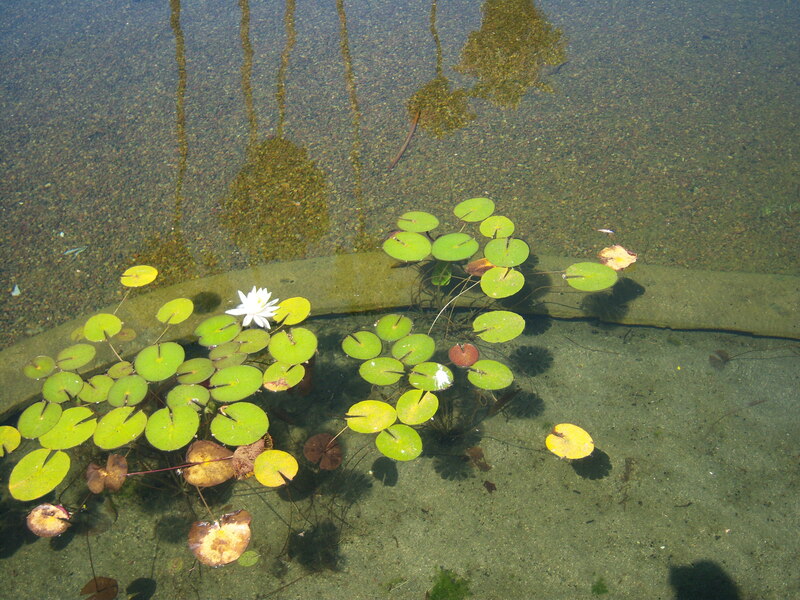 This filtration pond helps to keep the water clean from bacteria and nutrients. resource…water. For more information on how to conserve water tune in for more Aqua Squad updates. This is Julia, Dakota and Diamond. Today we followed the San Diego River with Richard from the River Park Foundation. 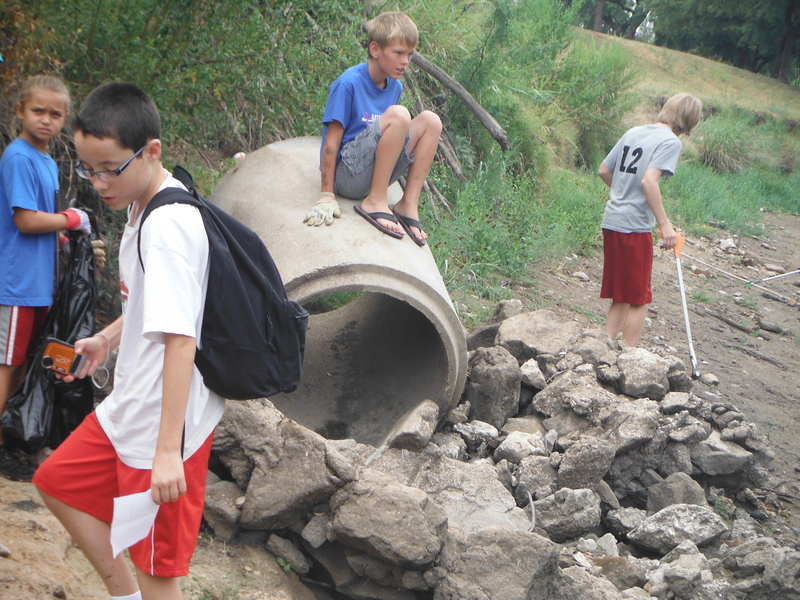 We started at Missions Trails Park and learned about riparian habitats, which are the plants and animals that live by the river. We also saw a really cool snake at the visitors center, his name was Curtis. We learned that the native sage and buckwheat are important to maintain a healthy ecosystem. Next Richard told us about the Old Mission Dam, which was finished in 1816. Walking across the dam made us feel like we were going through time when Indians worked hard to get this built for the mission. Next we visited some community preserves with nature trails and native plants. Richard told us to engage the community because when the community cares, change happens! And this is how we can bring the river back. 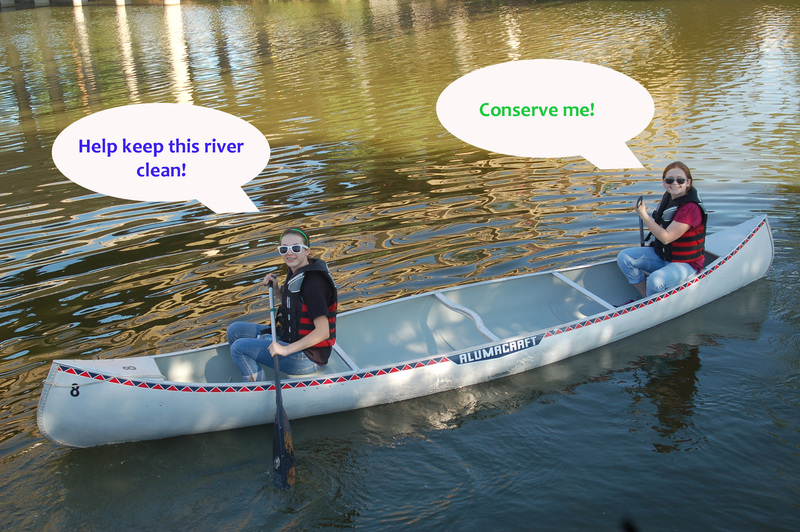 This inspired us to think about our own Concho River this way. Lastly we ended at the dog beach at Ocean Beach where the river meets the ocean. Can you believe that only 5% of the coastal wetlands remain? 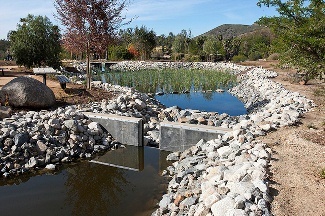 They serve as nurseries for many fish, insects, and native plants. 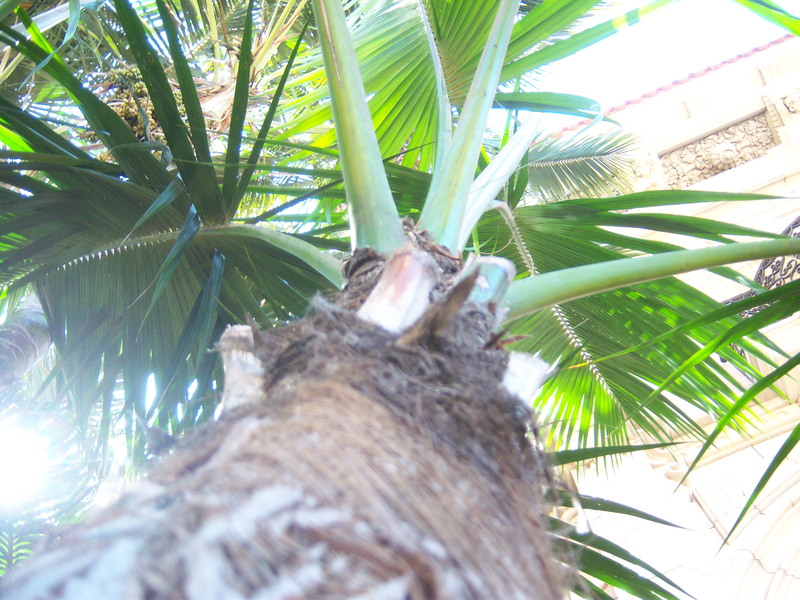 They also have endangered plant species such as the Birds Beak… which feels like a cotton swab but looks like needles! Following the San Diego River made us realize that we can make saving the river a really cool thing to do. To top off our day we played at La Jolla Beach the rest of the day. This was definitely different than West Texas! 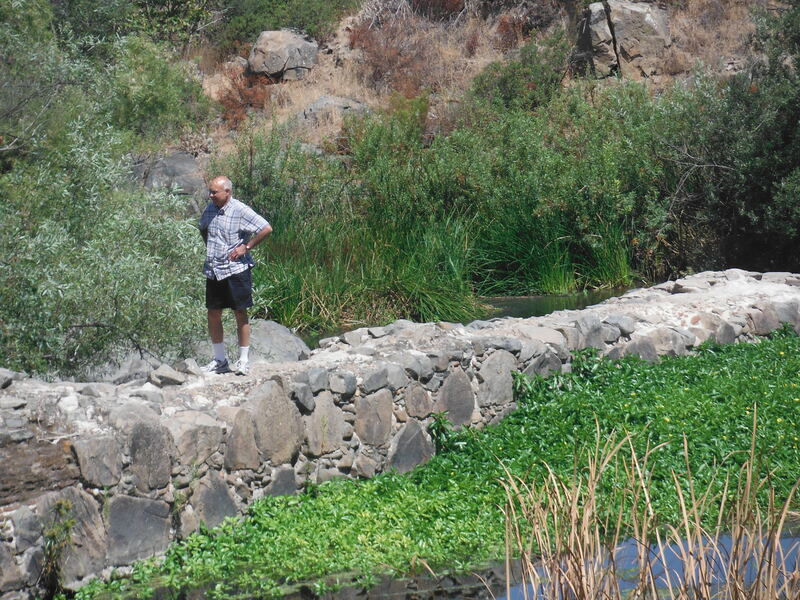 A man on the Old Mission Dam. 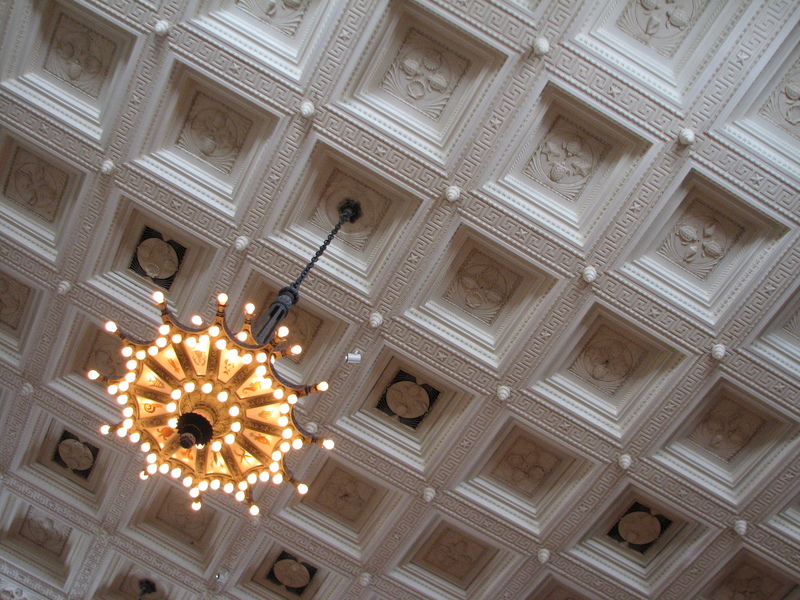 This was built in 1816! 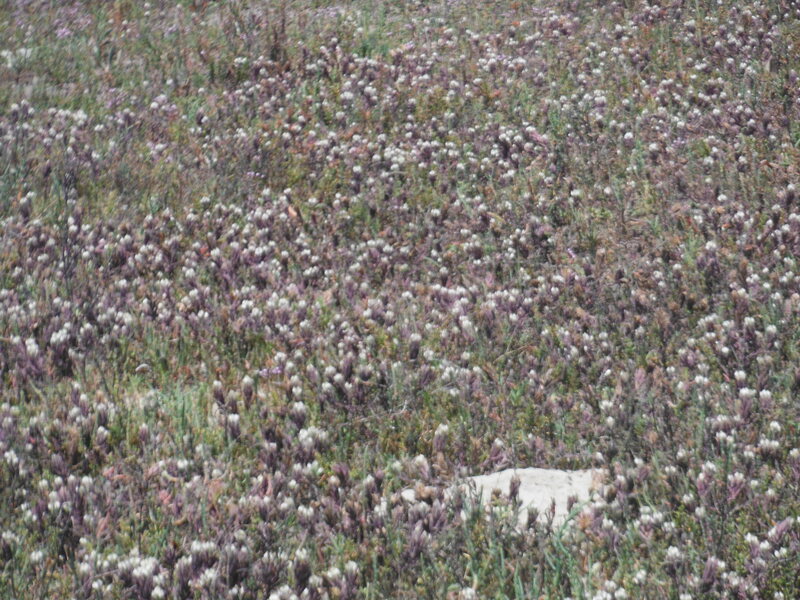 Here is a patch of Birds Beak on the dunes where the river meets the ocean…an endangered plant! At La Jolla Beach. 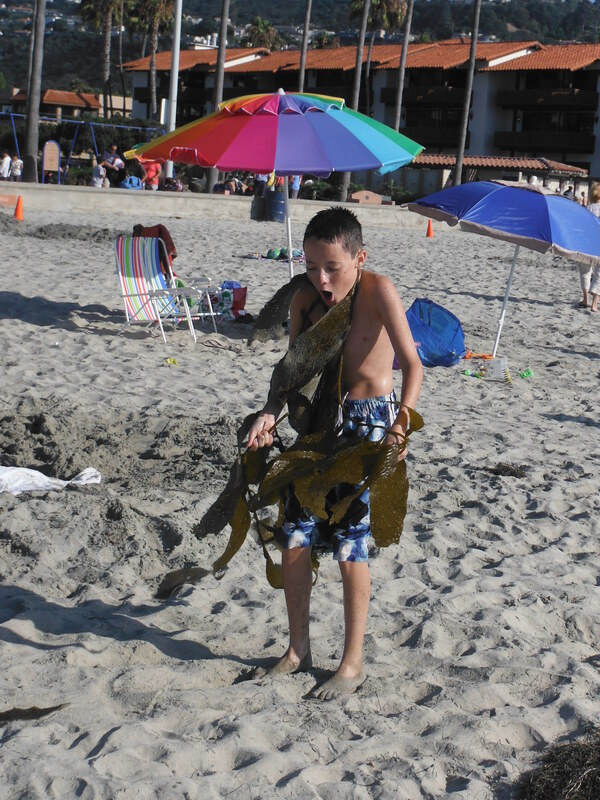 Andreas likes jumping rope with sea weed! That means 2 in one at the San Diego Zoo because saving species also means saving their habitats. WATER is in every habitat. This is John, Henry, and Andreas and were going to let you know what we experienced at the San Diego Zoo. After leaving the Museum of Photographic Arts we headed to the San Diego Zoo where we met Judi who told us a little about the Zoo and took us to our private tour with Wendy. Wendy took us to look at all the animals and even let us feed the camels. One big highlight of the day was meeting Doug Myers, Director of the San Diego Zoo. We were struck by how much he cared about not just the zoo but also the environment. It was cool to find out how much we had in common. We saw pandas! 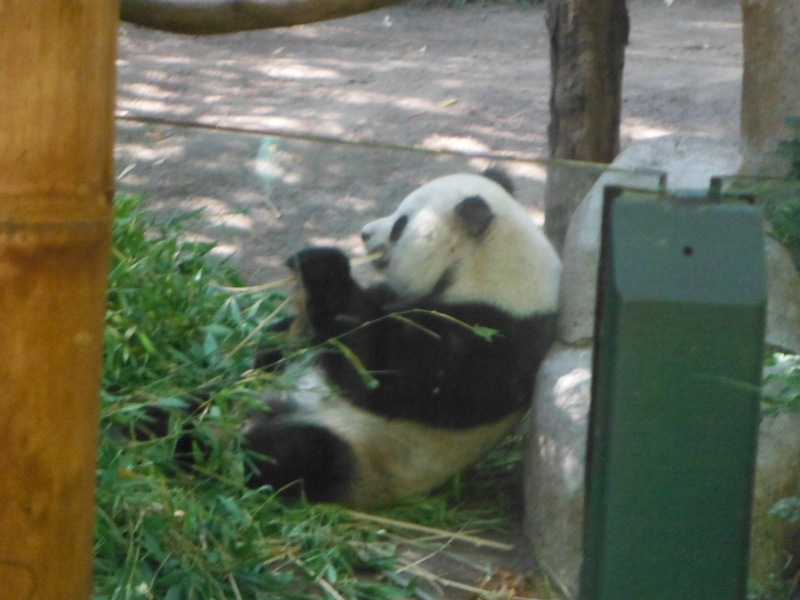 Zoo staff think that Yanzi may be pregnant! 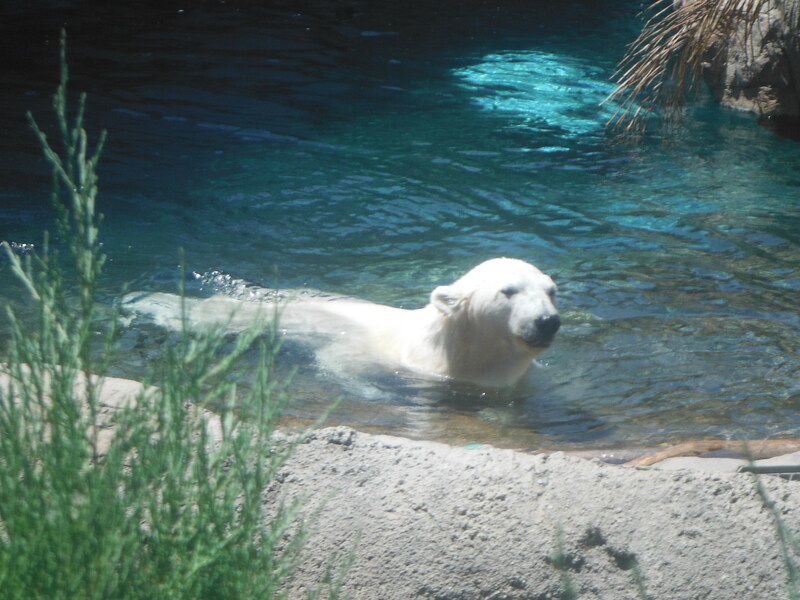 This is a picture of an awesome a polar bear that we saw on our private tour. This photo was taken by Andreas. We had a great time, learned a lot, and even got to share our water conservation ideas with a goofy zebra named Robert. Check it out! Hi there! This is Kirstin and Ashley here to tell you about our visit to the Museum of Photographic Arts. While there we got lots of ideas about how to use photography to communicate our message about water conservation. We took a photographic scavenger hunt around Balboa Park to practice techniques to improve our photographs. Below are some of the best photos from our hunt. Taking a photo from a worm’s eye view gives the audience the feeling that something is bigger and more important than the viewer. A bird’s eye view makes people feel as if they are larger and more important than what the photograph portrays. The rule of thirds is when you move the camera so the subject is off center by either 1 or 2 thirds. This helps the audience focus on one subject while also showing how the background ties to the main subject of the photo. 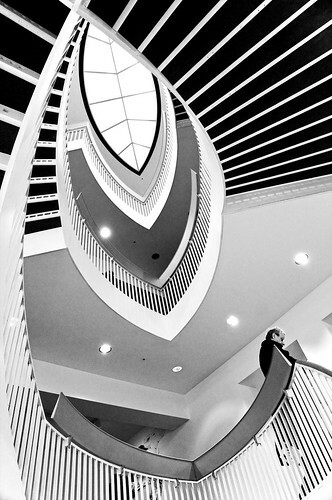 This photo uses line and shape to help lead your eye around the composition. Each of these techniques enhances our ability to communicate successfully through photography. This is definitely going to help us make Crisis in the Cocho (our photography exhibit opening in October) a great show! Our new friend James showing us how to print our photos in MOPA’s amazing library. So if you are ever in San Diego we would definitely recommend going to the Museum of Photographic Arts. 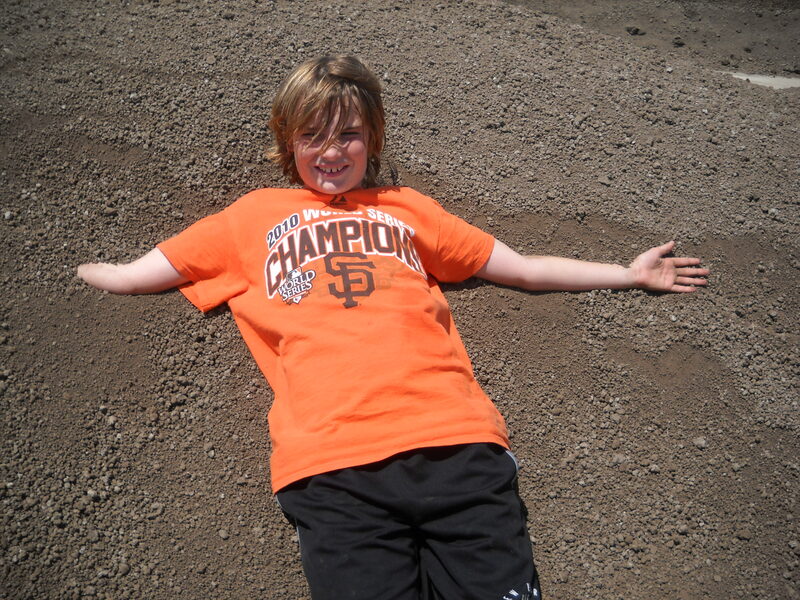 And thank you to James for being a wonderful tour guide! 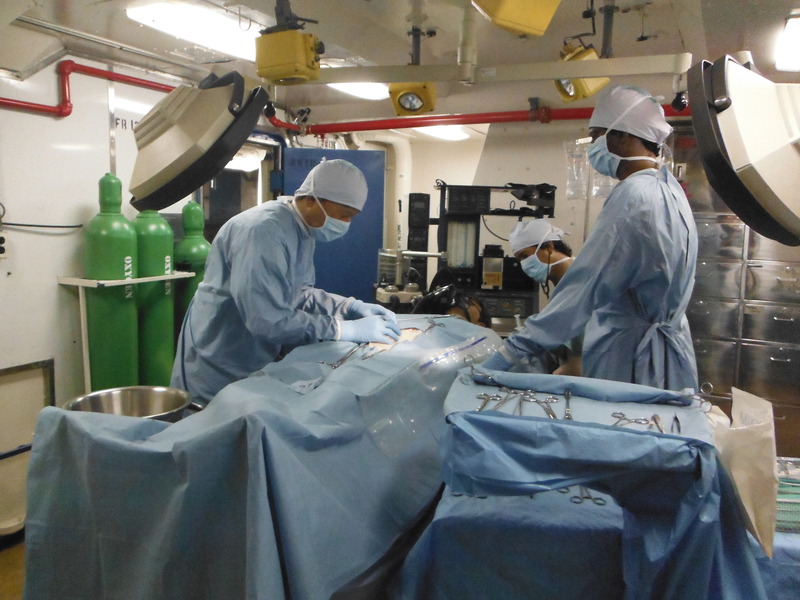 Think these are real surgeons? Nope! They are just wax figures showing what life was like on the USS Midway. 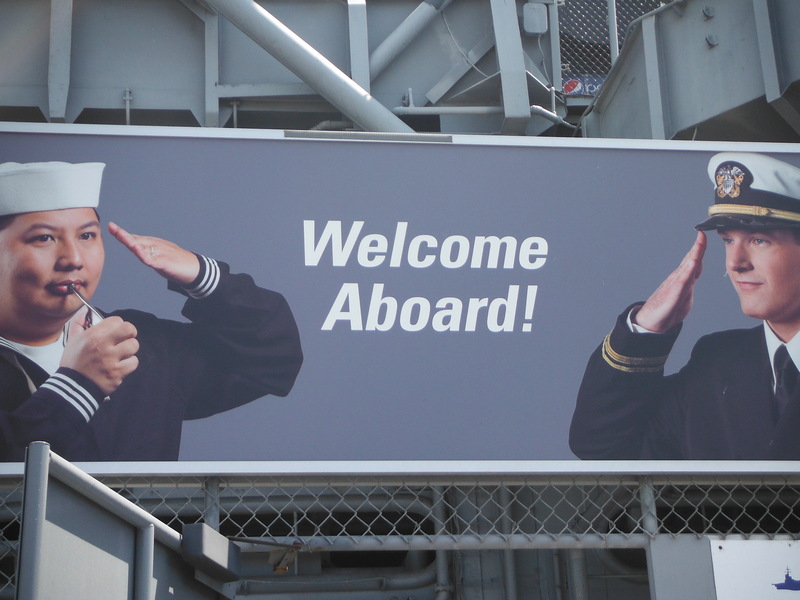 Welcome aboard the USS Midway Museum! This is Gillian and Joe here to tell you about some of the cool things we saw there. Click the picture to learn more about buffalo grass. This is a test post for Aqua Squad. We’re learning how to blog, so expect some new content soon! Are you a student in the San Angelo Independent School District and going into 7th or 8th grade next year (2012-2013 school year)? 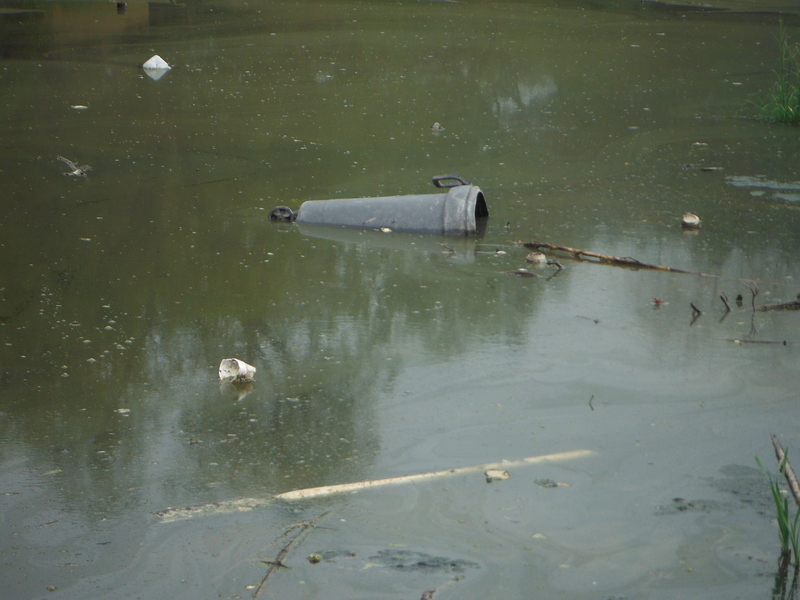 Have you heard a lot about water issues in San Angelo lately? Are you creative? Do you love to help? Then you should apply for Aqua Squad! Selected students will travel to San Diego to learn about photography and H20 issues. 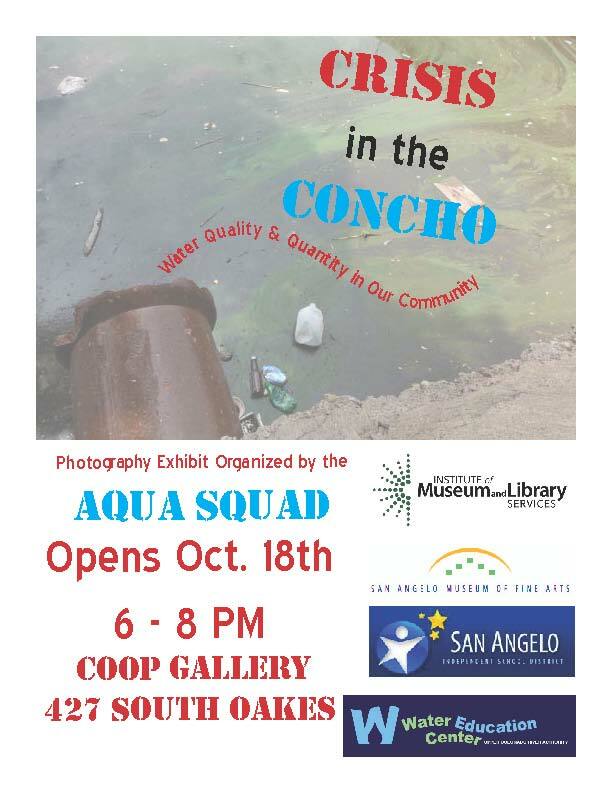 Your final challenge is to create a photography exhibit about water in San Angelo and beyond! Where in the World is Nature? Cotton is so cool! Literally. We have been finding nature everywhere! After touring the museum galleries with Megan and witnessing nature in art… students headed over to the UCRA Water Education Center with Christy (that’s me) to jump into the science of it. 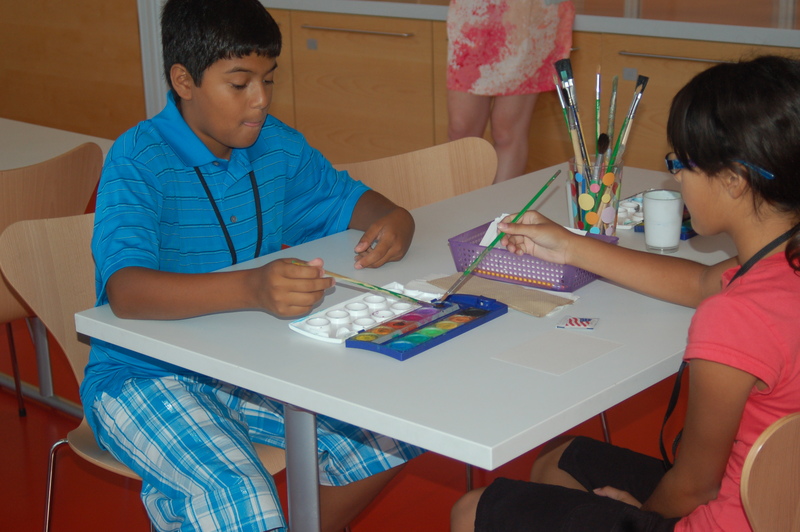 In Session 2 of Art/Science Fusion we found limestone in the art museum building (made from sea creatures…. can you believe that? ), cotton in our blue jeans, mesquite wood in tables and sheep’s wool in blankets. Humans are more connected to nature than we realize. And we are pretty smart about how to use these resources – because we watched how they are used in nature! Cotton is light and breezy to disperse those seeds and wool keeps sheep warm and dry and so it keeps us warm and dry too. After thinking about all of this, we classified and sorted many PRODUCTS made from these natural resources into the right bins. We did amazingly well! We also really understood how taking care of the world around us is so important in making sure we have these resources for many more years. Welcome to the spring 2012 session of Art/Science Fusion. The big question we are answering during the next 4 weeks is: Where in the World is Nature? The videos, projects and other goodies we post here will help you connect Art/Science Fusion to the classroom. Check back every week for new posts. 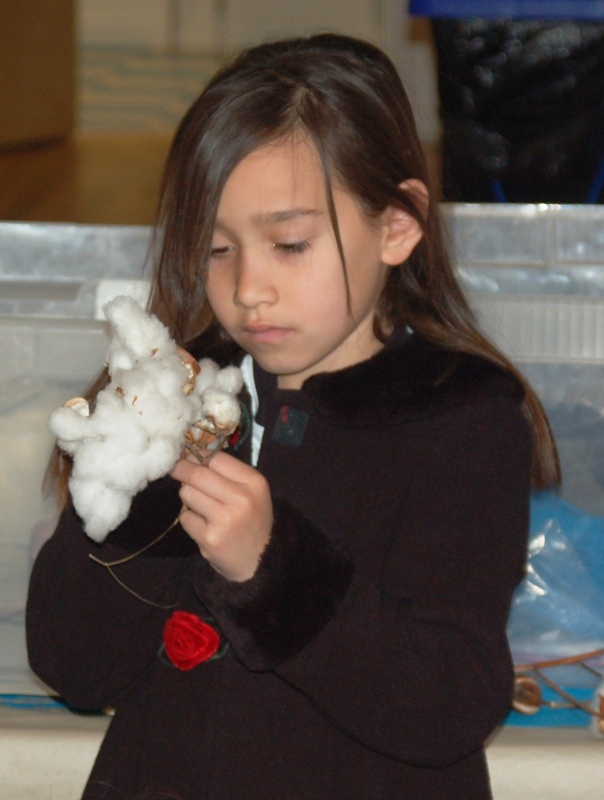 To get started, work as a class to make a list of things that come from nature. Then, send that list to Megan at megan@samfa.org. I will post the lists on the blog. Let’s see which classroom can name the most things from nature. Ready? Go! Looking forward to seeing you this spring. And psst! The next post is a sneak peek of one of the works you will see on the tour. What materials did Lloyd Blanks use to create this artwork? Find out on our tour! Gallons and gallons of trees? 1. Art/Science Fusion final show on December 15th! We just got some great press in the San Angelo Standard Times, so we know we’re going to see a crowd. Check it out! Below are some photos from the fall programs. 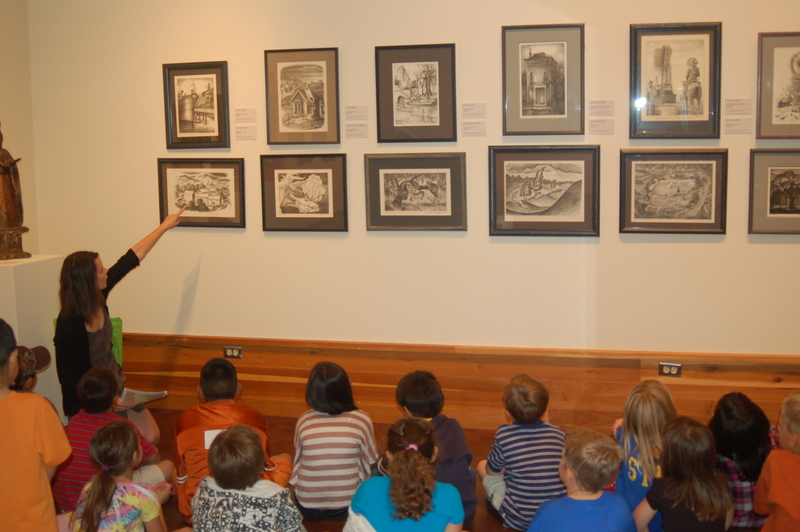 Students talking about lithographs from SAMFA's Early Texas Art collection. Christy shows some desert survivors during her session about adaptation. 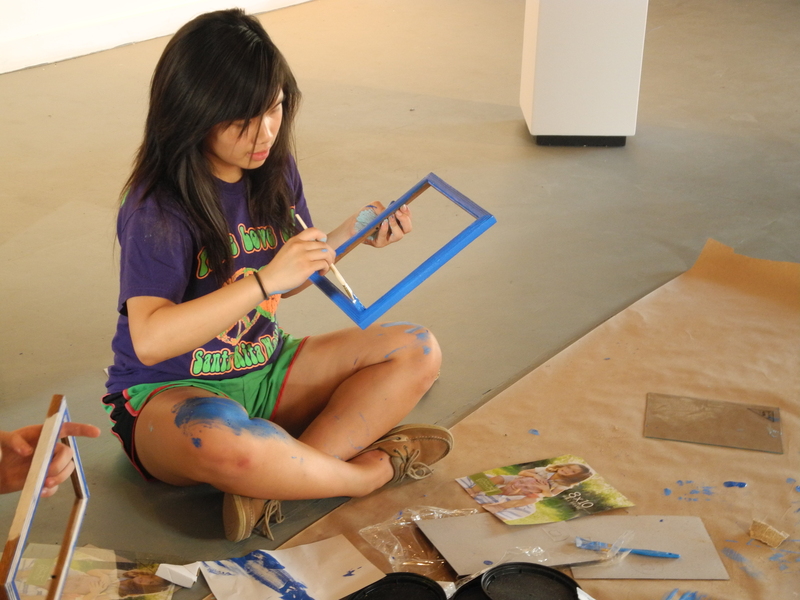 Students learn to create linoleum prints with Bekah in the Education Studio. 2. Aqua Squad’s exhibit ideas are coming together in physical form! After cleaning out over 100 gallon jugs from the local recycling center (Dr. Christy Youker gets an enormous HIGH FIVE for that heroic feat–some of those jugs were pretty rancid), Bekah and Megan built two gallon trees (with the help of Emily) to represent how much water most households use per day. Aqua Squad came up with this idea and now it’s real–just in time for the holiday season. Click here to see how Aqua Squad came up with this great idea. The official “tree lighting” will be during the Art/Science Fusion final show. Come back after Thursday to see a video of the tree lighting. A work in progress. Soon it will have lights and ornaments with important water usage factoids. What are they building in there? Something pretty AWESOME! Do High Test Scores Really Help? Just got this article in my inbox from Computing Education Blog. If you can, please share it with as many administrators and school board members as possible. If we want success for our youth here in America, we need to have an honest conversation about our priorities for education. Testing causes a lot of stress for students, teachers and administrators. This article made me ask, “Is it worth it?” If our test scores are not reflecting or positively affecting how our students perform in real life, what’s the point? Standardized testing is a great way to see if students as a whole are retaining certain content, but students need to do more with content than retain it. They need to live with it. Activities like these deliver and reinforce content through participation rather than memorization and recall. It also connects content to real world problems like water conservation here in San Angelo. Project-based curriculum is rooted in the idea that learning is important for a healthy community and successful career. Students also smile a lot during our programs–not only is learning important for a great job, it’s also part of a happy life. We work directly with our local school district (SAISD) to design and implement all of these programs, and a lot of our content delivery is relieved from effective classroom education. SAMFA and UCRA provide places where students can reinforce and apply content outside the classroom. 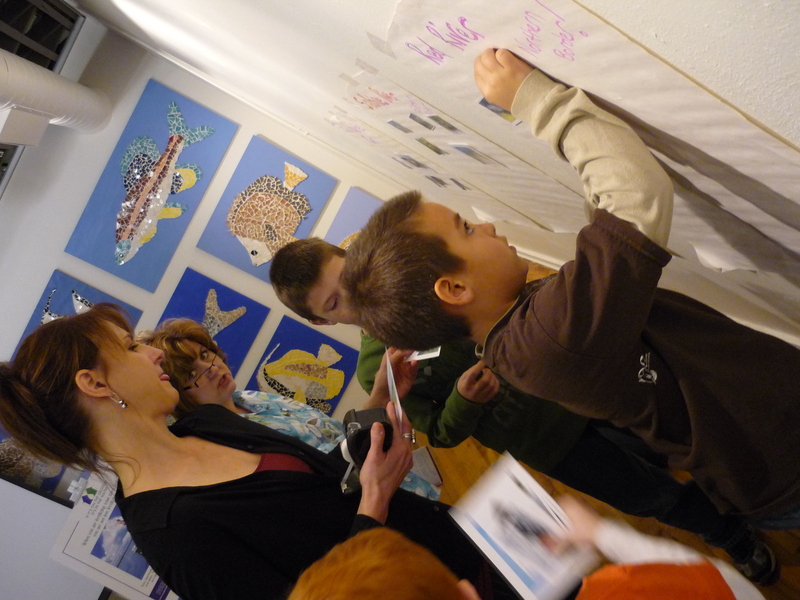 Are partnerships between schools, museums, and community organizations a way to reach a happy medium between test-prep, content standards, and unique experiences that make learning meaningful in real life? They could be, but right now it isn’t a perfect system that alleviates all test stress. 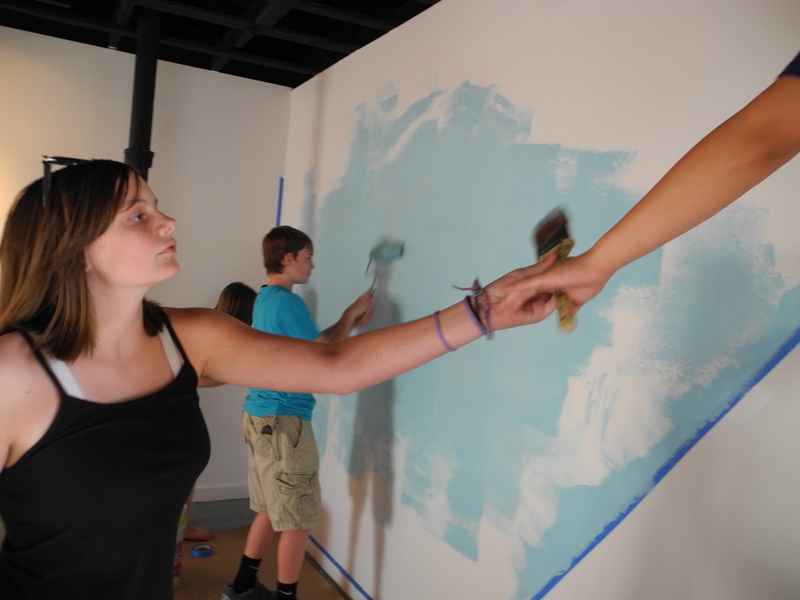 The Center for Creative Energy often works outside the classroom system to facilitate programs. For example, we switched our audience for Art/Science Fusion from 3rd grade to 2nd because of test prep conflict issues in the spring. 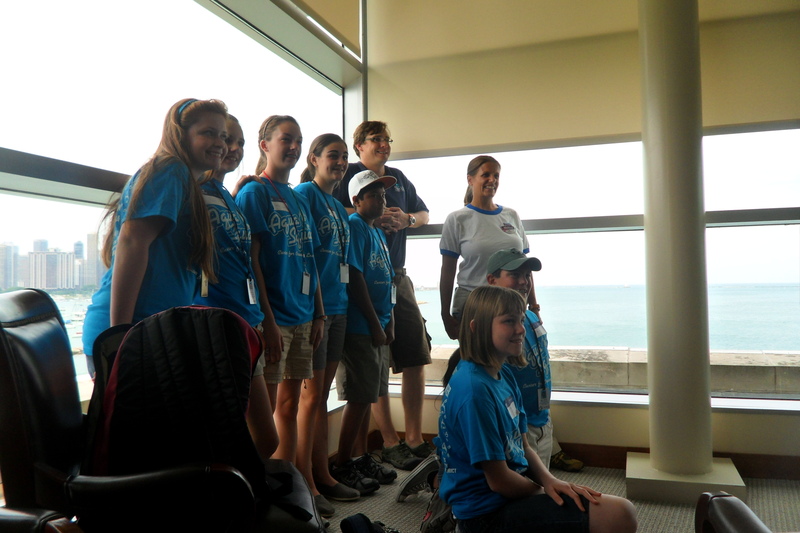 Aqua Squad and Camp Odyssey are summer enrichment programs not directly integrated into the classroom. However, could our programs work during the school year alongside test preparation, even in support of it? Of course. Is trying it worth the risk to schools and administrators who stand to loose funding and jobs because of low performance? Probably not. Incentive based standardized testing is a reality that every educator has to deal with until policy adjusts to real statistics outlined in great articles like the one above. For now, we are providing unique art and science programs for as many students as we can. 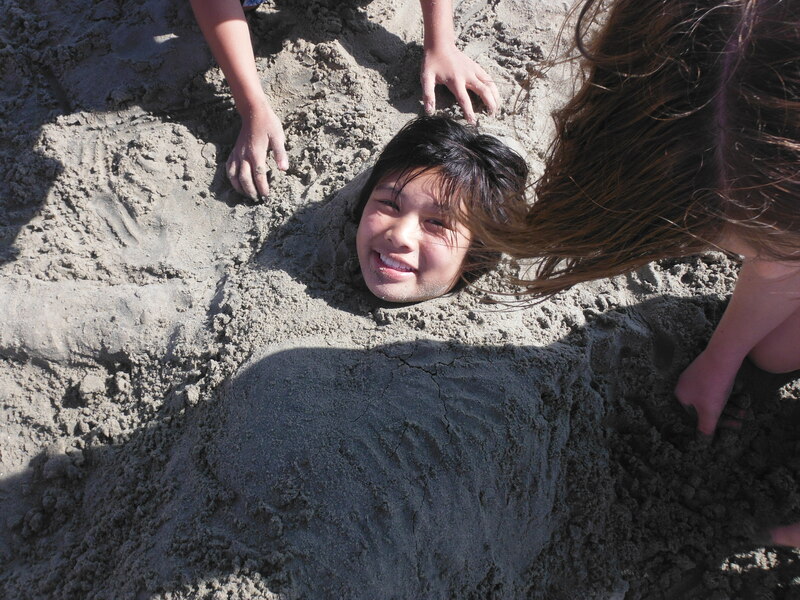 Students who haven’t yet experienced test related stress and those enjoying summer vacation to forget it are the ones who can gain the most from programs that connect learning to a happy life. To end on a seriously sappy note, here’s a slideshow of happy smiles! 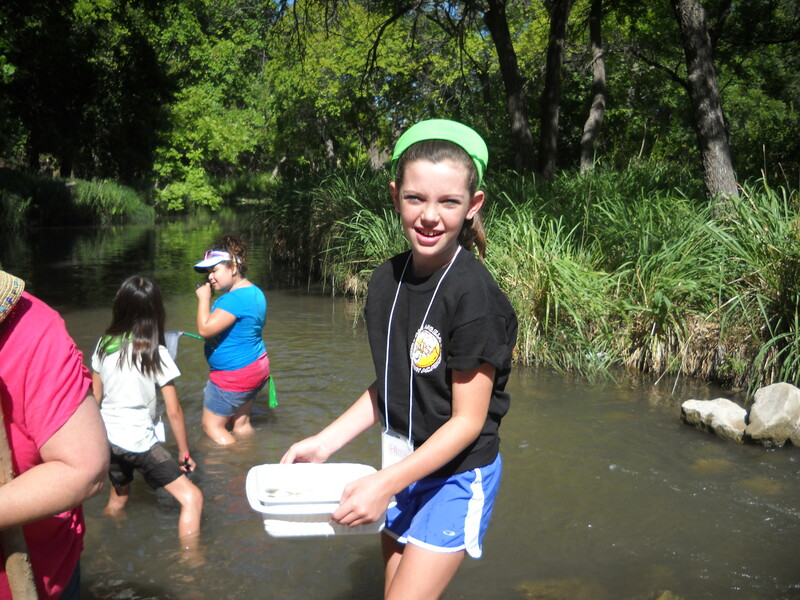 Camp Odyssey: Where the Water Flows! Where did the summer go? Camp Odyssey came and went so fast – it is already September and we hadn’t even let you know how much fun we had at this incredible week-long camp! 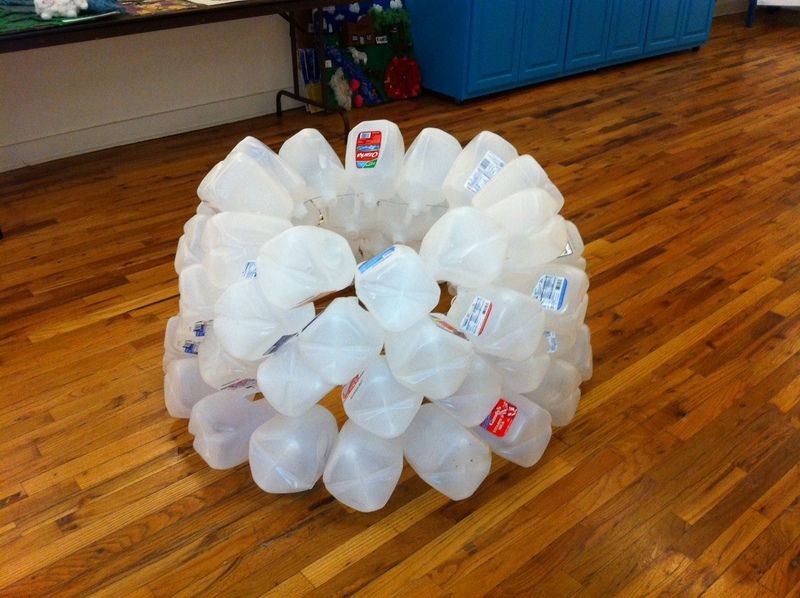 Our mission: to explore the workings of our water system and then put it together in an amazingly creative way on how it inspired us. Our journey began that first (very HOT!) 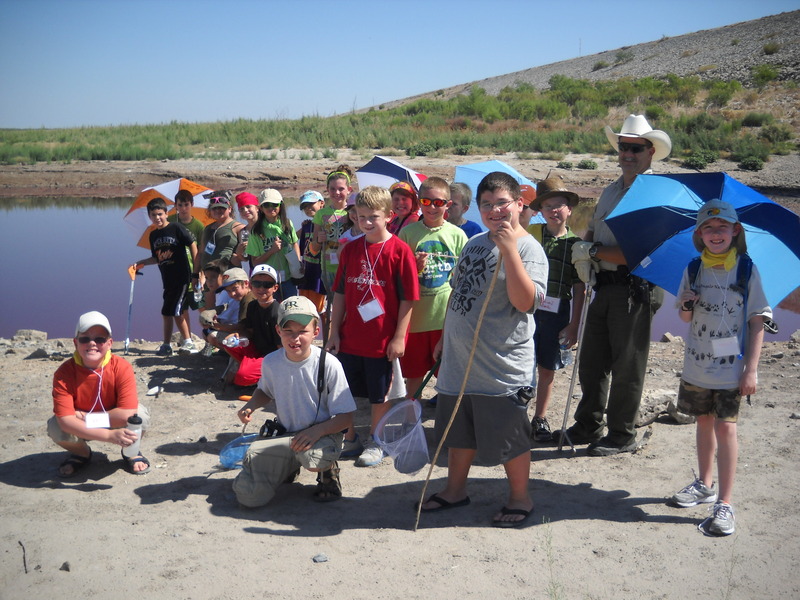 week in August at Fort Concho Elementary where 40 enthusiastic campers met to take on the trek through San Angelo’s water system. With journals in hand, and with the guidance of our fearless SAISD teacher-leaders, we began at the South Concho River in Christoval where we calculated flow and investigated macroinvertebrates (water insects!) in their different larval stages to determine water quality. We even came across a water snake that wasn’t so happy to see us! This is what was left of O.C. Fisher Reservoir. The final day was when the campers put it all together and were ready to tell the public what they gained from this experience. With the help of Bekah from the Art Museum, Cami with the San Angelo Civic Ballet, our awesome expert-teachers and UCRA staff, the products were awe-inspiring! From an interpretive dance of the wastewater system, murals of our lakes, and a 3D Model of our water system, the campers had much to show off in our performance. We even had a hanging tumbleweed with perfectly placed dead fish to get our point across of our water problems! Henry shows us the compost from the Wastewater Plant. The water and the "sludge" are recycled! Amazing! All we have to say about Camp Odyssey is “Whoa!! Now that was a journey!” We sure hope you come along next summer…. What a nice vision for our lakes! This is one of the murals the campers created. Wow! It has been one amazing summer–I can’t believe it’s the middle of September already! Check back to see Aqua Squad racing canoes. It was pretty epic! Aqua Squad will also present to the boards of the Upper Colorado River Authority and San Angelo Independent School District in the upcoming weeks. They will also head up an awesome hands-on station and art installation at the Eco Fair Family Day on October 8 at SAMFA. (Bring a plastic gallon jug to the event if you want to be part of the action)! Curious about their exhibition ideas and loan kits? So far, all I will say is that they involve pirate games, toilets, and lots of creativity and water facts! 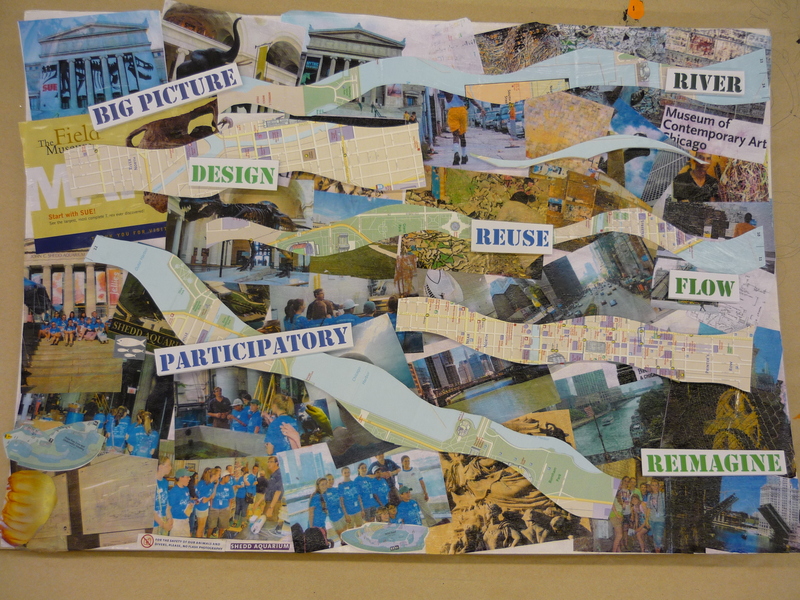 Below are the inspiration boards Aqua Squad created to share their ideas. Good Design! Emily and Anyssa created a board about the elements and principles of design using recycled materials. They also changed the old fashioned color wheel into a color wave! Inspiration from Chicago! Anne Marie, Ruby, and Will designed a board to highlight the most inspirational museums in Chicago. The font in all three inspiration boards came from their experience marking storm drains this summer with the UCRA. See the gallery below for pictures of that. Jugs and jugs and jugs! 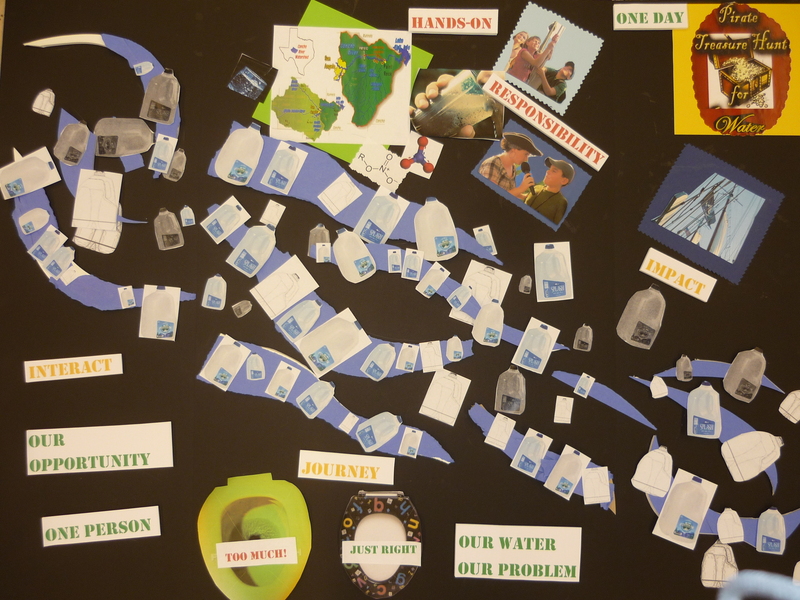 Addison and Ethan designed this board to show how much water we use, but also how much waste we throw into our rivers. Later this board will be revamped into an awesome exhibition component and educational loan kit for schools! Note Will being held hostage by a pirate with a microphone in the upper corner. Awesome! 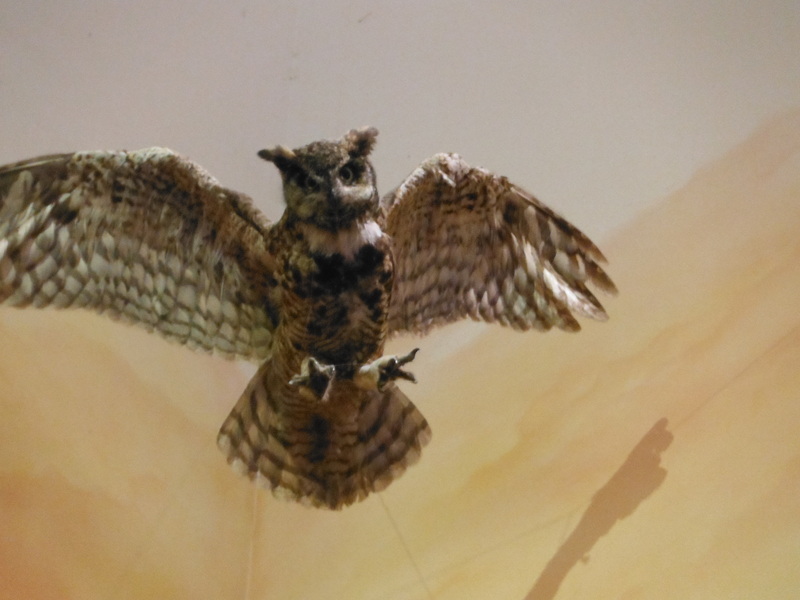 Okay, okay–I’ll give you more details about their exhibition and educational resource ideas! The educational loan kit is a pirate themed board game about watersheds that will be take middle school students on a hunt for clean water. The jugs and toilets are part of an exhibit showing how much water we use daily (about 80 gallons!) and what we can do to use less. Both are going to be AWESOME! The final products will be developed within the next few months, so be sure to check back on their progress. 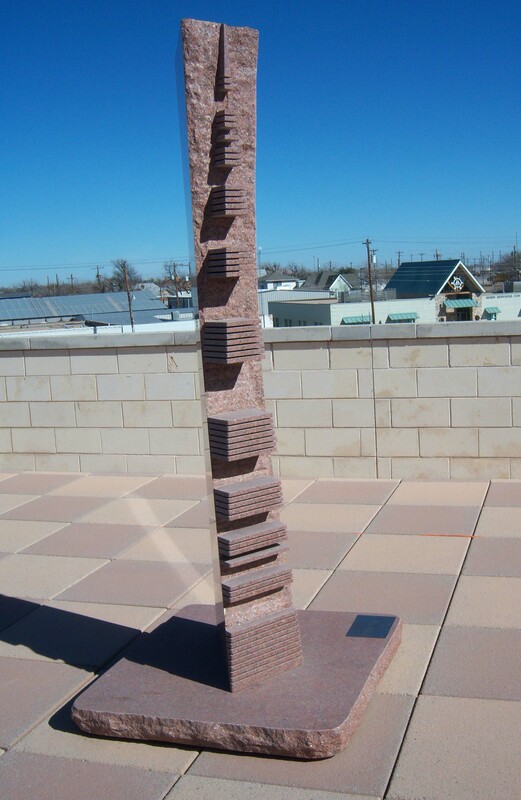 All of the projects were inspired by their experiences in Chicago, their love of water, and their dedication to the future of the San Angelo community. Drought may be lingering, but with these creative kids on the task of educating the public about water conservation and quality, I’m hopeful that this community will continue to grow and thrive as it invents new solutions to solve the water crisis. 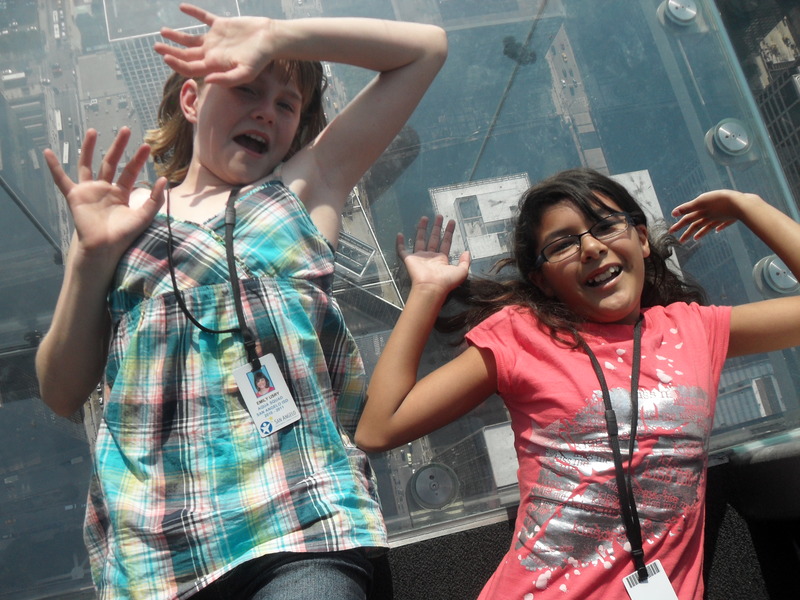 To sum up the Summer, here’s a gallery of the Chicago trip and all of the awesome things Aqua Squad did do far! Enjoy! This fall’s Art/Science Fusion couldn’t be more timely for West Texas, or serious! Just today, USA Today featured San Angelo in a front page story about one of the worst droughts in Texas history. This year also marks the 75th anniversary of the 1936 Flood, during which the Concho River took out 12 buildings downtown and destroyed 300 homes! 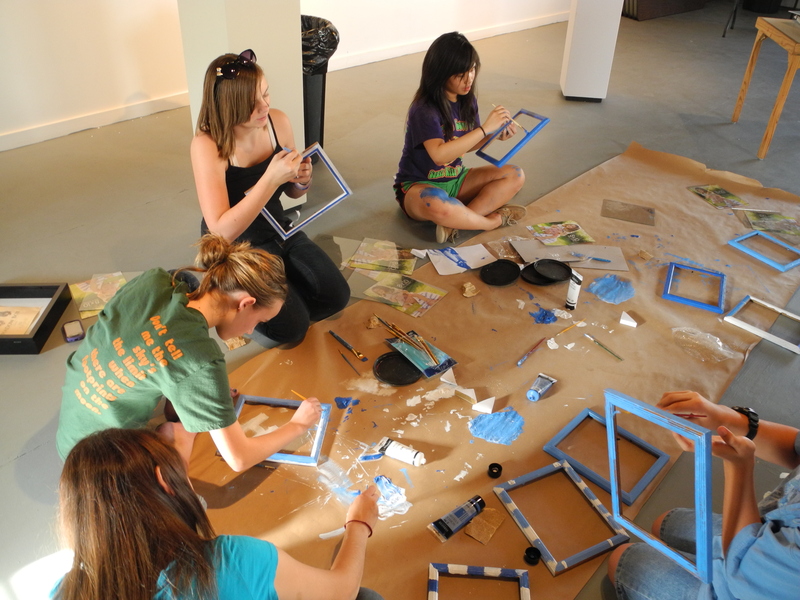 The theme for Art/Science Fusion is Flood and Drought: With and Without Water in West Texas. The goal is to get 2nd graders thinking about the critical role water plays in everyday life, and how we in San Angelo can work to respect and conserve this precious and powerful resource. 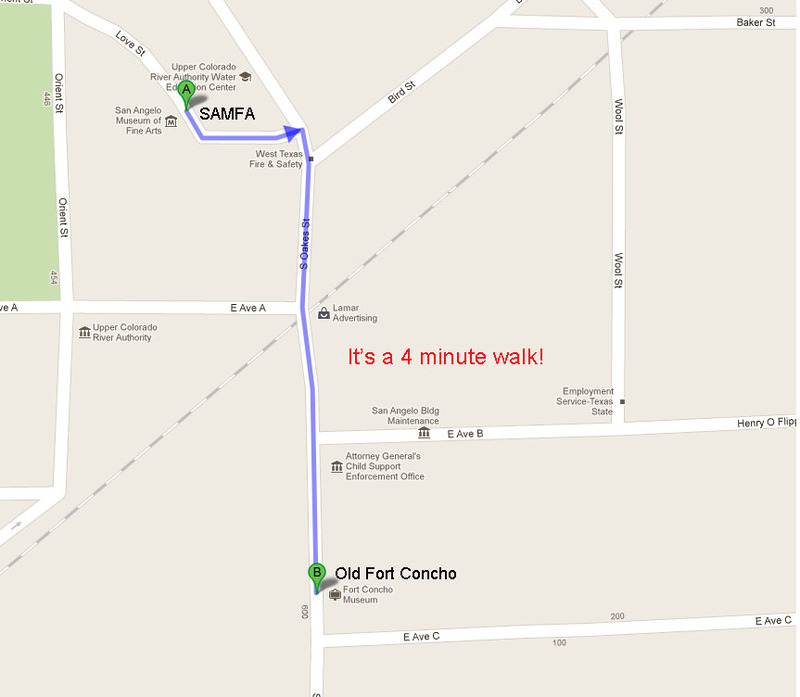 They will take a tour of the West Texas collection at SAMFA with Megan, learn about desert adaptation with Christy at the UCRA, and then make prints about our water situation with Bekah in the Education Studio. 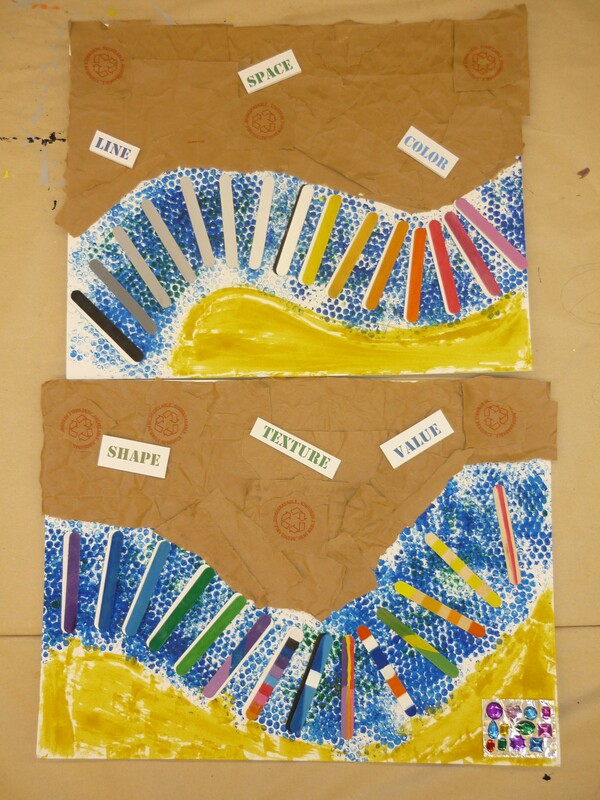 Below is a sneak preview of some of the art the 2nd graders will see, and some useful links related to the program. Check back for a full curriculum, and also be sure to see Old Fort Concho’s new exhibition on the 1936 Flood opening on Saturday, September 17th (the actual anniversary)! Although visiting the Fort for the flood exhibition isn’t possible during the Art/Science Fusion sessions, we STRONGLY encourage your class or school to take a trip over to check out this timely exhibition either after one of your Art/Science Fusion sessions or later in the year. It would be a great way to add some local history into your curriculum. We’ll be touching on Texas history a bit, but nobody can do it like Bob and his team of educators next door! I will officially say the more interdisciplinary the better. 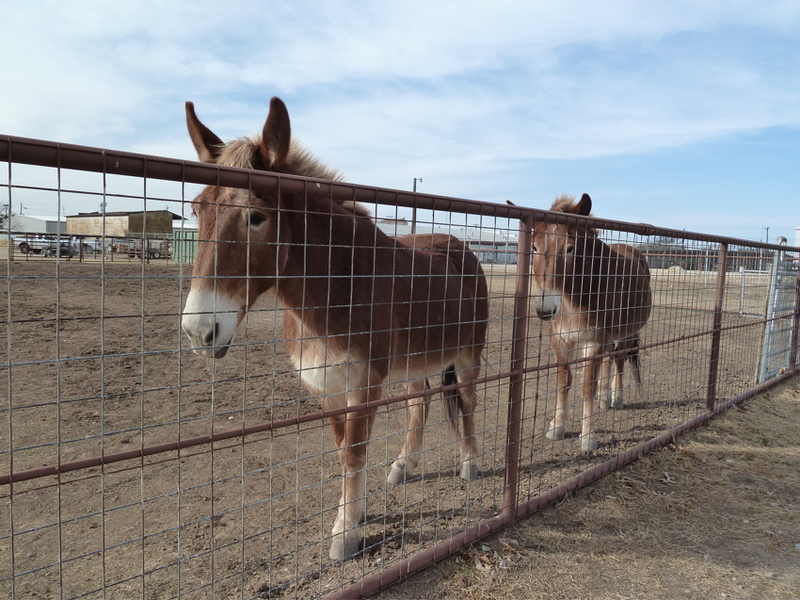 Plus I love the Fort–they have good history and a couple of ADORABLE mules! Hi… this is Sully and Anne Marie! Today’s adventure began at the Museum of Contemporary Art with Alex, our tour guide. Contemporary art, we learned, is art created by artists that are still living (well, usually). We were especially excited by the works of Mark Bradford. The most interesting part was the way the art was arranged. The walls were bright white which made the color pop! The lighting was perfectly pointed to the works which made it even more intriguing. The artist took everyday items and also things off the street and made them his own in a way that conveyed a strong message. And the thing about contemporary art is that it can often be perceived in different ways by different people! One piece in particular was a GIANT boat that the community in New Orleans built after the devastating hurricane Katrina practically destroyed their homes and took many loved ones. The boat represented the personal struggles people went through to get through these hard times the flood had caused. As Aqua Squad, we were inspired by the use of soundless video (like Mark Bradford used) to create a strong visual message. And using everyday materials was also something we could take back with us to inspire others to take better care of our environment. 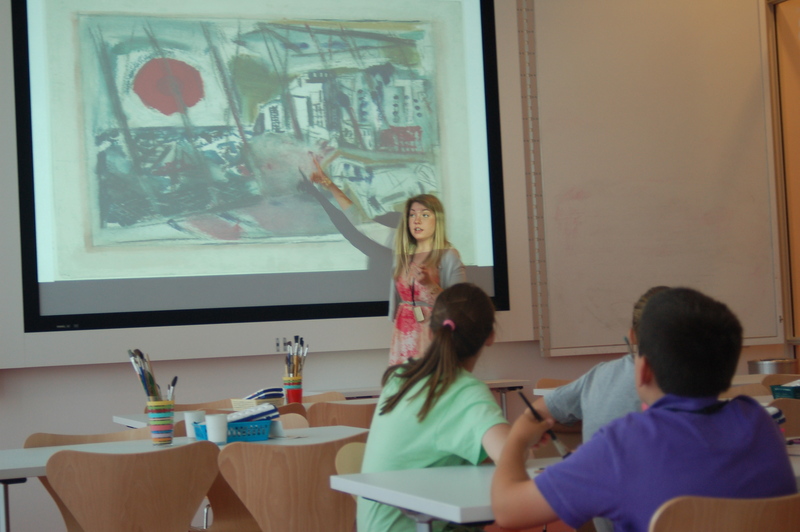 We began to think more abstractly and creatively – which was a big message from the Museum of Contemporary Art! Here’s a video from the tour. Addison, Ann-Marie and Will are “owning it”! 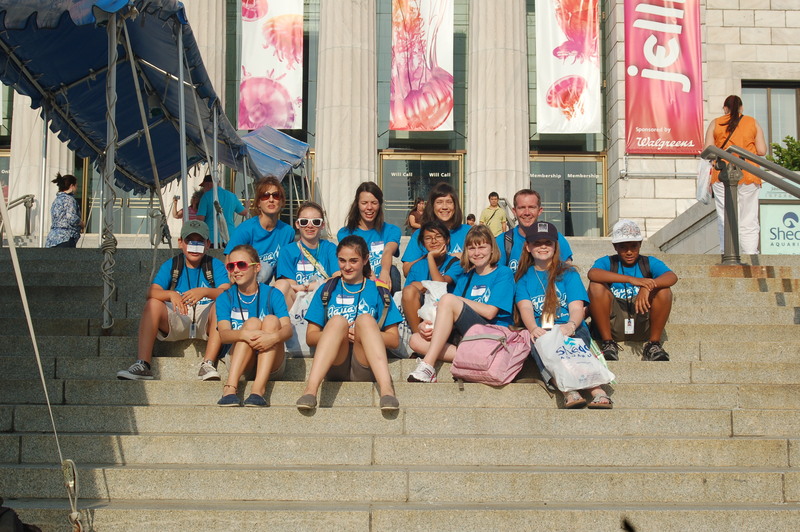 Today Ethan and Emily (who are writing this blog) and the other Aqua Squad members went to the Art Institute of Chicago. 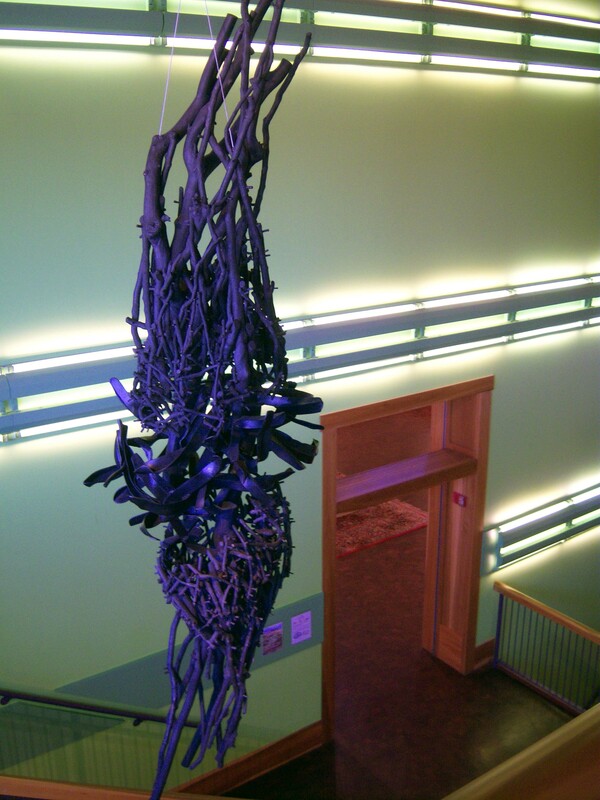 We each gained our own new perspective and experienced innovation through art. Georgia O’ Keefe’s last completed painting helped us to realize that things are not always as they seem. When asked what we saw in Sky Above Clouds, all of our answers were different. Not knowing what the title was, we all gave our answers: glaciers, clouds, white marble with blue grout (like flooring), a path, the sky, and even Chicago. It turns out it was painting of clouds from an airplane view. It looked familiar to us because it was very cloudy from our windows on the plane to Chicago. Georgia O’ Keefe was inspired by her first plane ride at age 62. For some of us in Aqua Squad, it was our first flight, too! 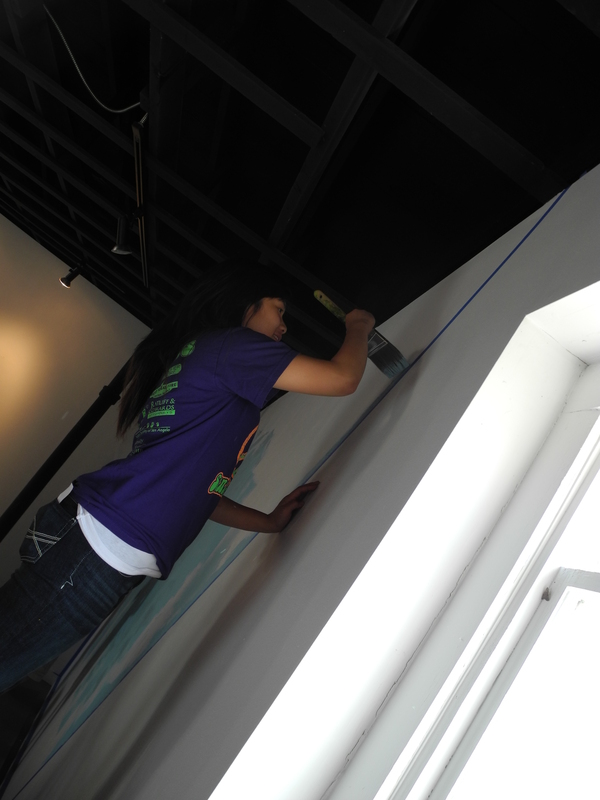 We learned that each person has their own perspective on art, and each piece gives out its own message to every person. We also learned that we all have a unique sense of creativity, and used innovative artistic techniques to express our personal views of Chicago’s beautiful skyline and parks. 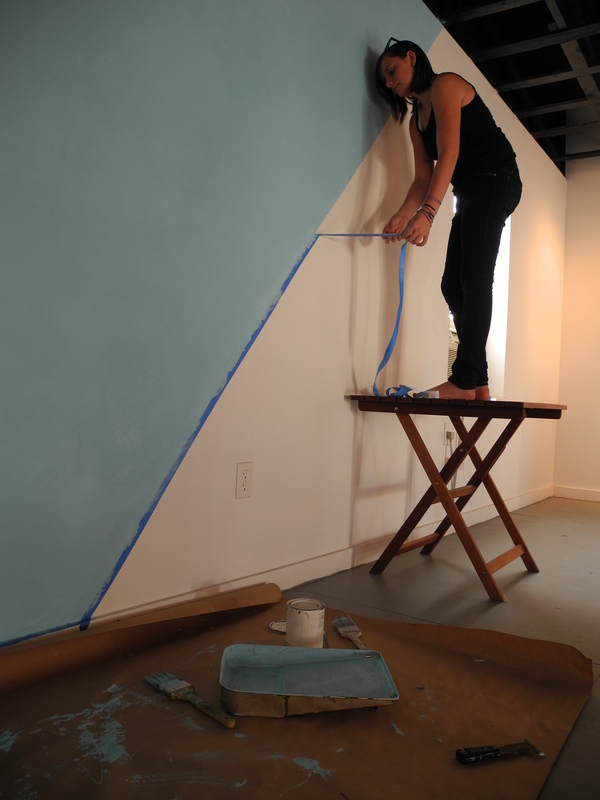 Below are a few images of our experiments and works in progress. Emily's brush experiments. Stay tuned for finished products! (The Art Institute will mail them to us once dry). 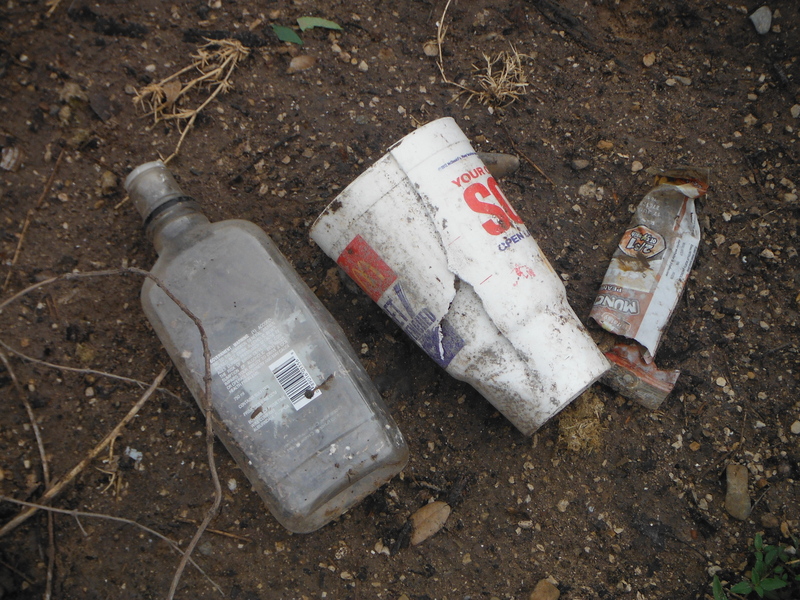 So how does all this relate to what we’re doing with water in San Angelo? Well, it helps us to become educational designers by challenging and inspiring us to create innovative ideas for helping our water systems! Today was an unbelievable experience that we will never forget! 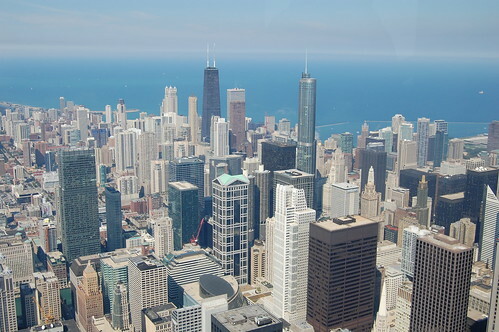 To end, here are some of the most innovative things we’ve seen in Chicago so far! And Anish Kapoor’s Cloud Gate at Millennium Park! Addison and Will of Aqua Squad SHEDD Some Light on Water Conservation. San Angelo has some problems with our water. We’re in the middle of a huge drought, the Concho River was designated an impaired body of water by the EPA, and three of our four lakes are drying up. Chicago has a plentiful source of water, but struggles with issues of quality and others trying to take water from Lake Michigan and other Great Lakes by building pipelines away from the city. Water is a precious resource everywhere! Today we explored how the Shedd Aquarium tries to conserve water. We went behind the scenes to explore how water goes from Chicago’s municipal water supply and through the water carbon filter system, and then treated to replicate the types of water the animals live in. Tyler the Sea Lion was splashing 2,000 gallons of water out of his tank…per day (to Allen’s dismay). Tyler is the star of the sea lion dolphin show, so selling or giving Tyler away probably wasn’t an option. Instead, they put in a drain to collect the water and pump it back into Tyler’s tank. Tyler now splashes happily ever after with no water wasted. Below is a video of Tyler performing some amazing tricks. He was awesome! We were also surprised to know that only 54% of the water is for animals. The other 46% is for people! 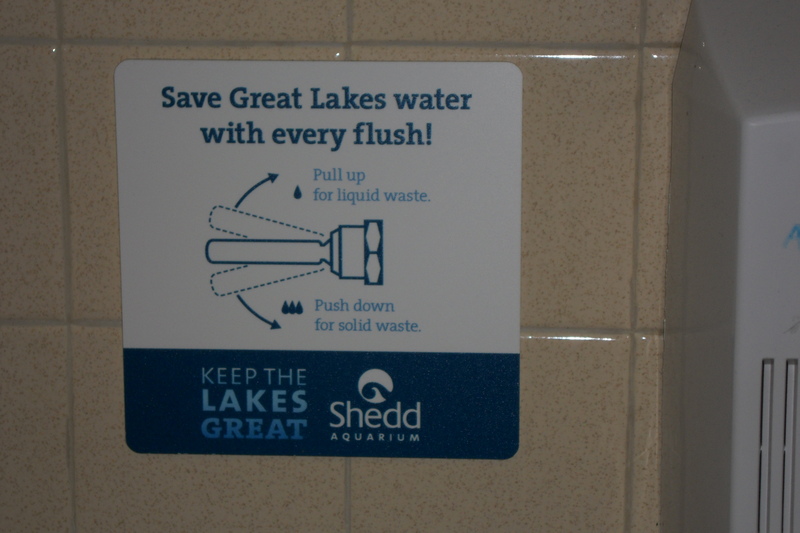 The picture below shows just one way the Shedd helps conserve water for human use. Once all this water is used, the Shedd partially cleans it to prevent the waste water treatment plant from being strained and to help keep the water from becoming contaminated by algae and bacteria from exotic species . We concluded that that all the water at the Shedd is for people. We’re the ones that built the aquarium in 1930. We’re the ones that want to spend hours and hours looking at animals. 2.1 million people per year visit the Shedd Aquarium. This is for us! So we’re happy to know the Shedd is working so hard to conserve water and keep it clean. Conserving water is all of our responsibility, and you don’t have to be an awesome expert like Allen to save water. 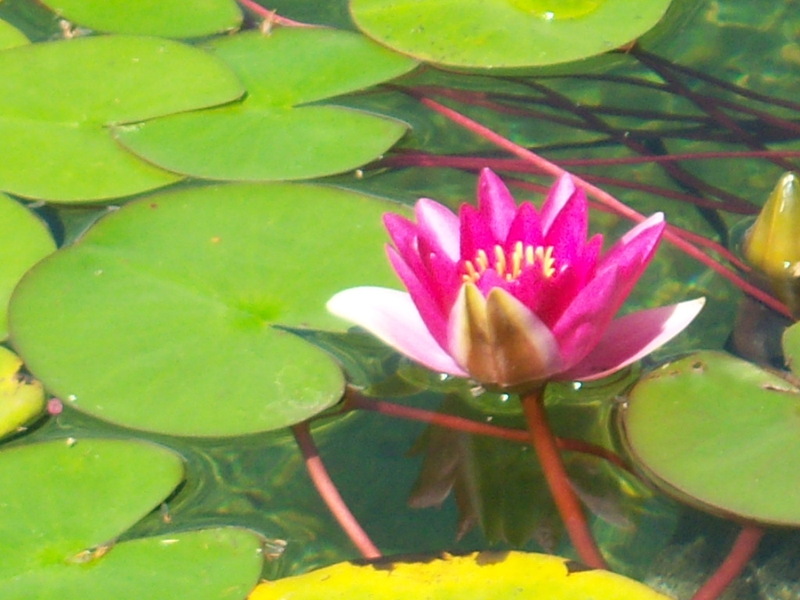 Find out about your local water laws. Could you use rainwater or grey water to to water your lawn? Water early morning or early evening. Look into low flow toilets, shower heads, and washing machines. P.S. The Shedd doesn’t use pesticides. They pick their weeds because they don’t want to pollute Lake Michigan. 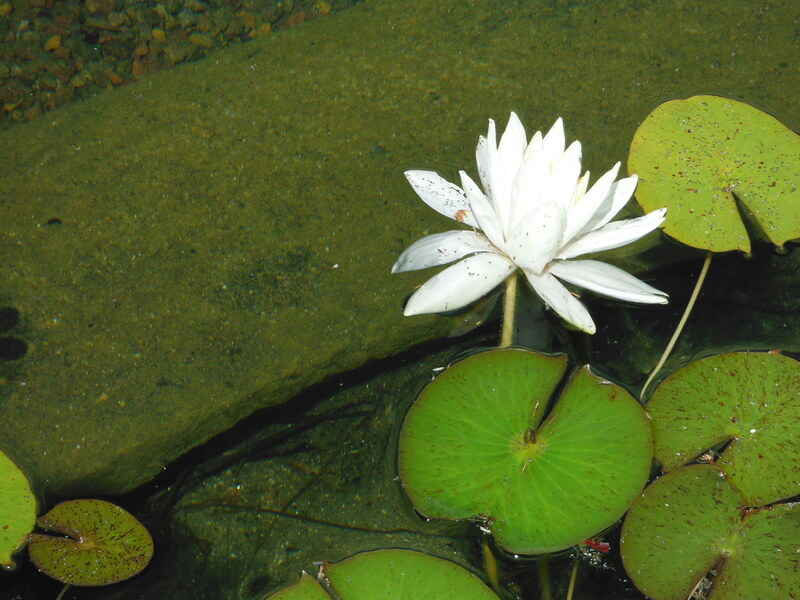 After all, the staff, visitors and animals use that water to live! 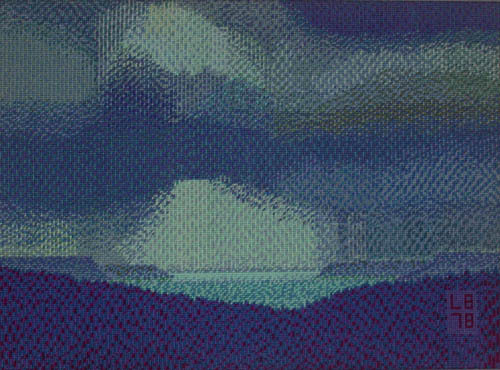 What Can We Learn about Water, Art and Science by a Great Lake? This Sunday (at 6 AM) Aqua Squad, Megan, Lillian and Christy will be flying off to Chicago for an intense week of brainstorming, creativity, exploration, research, art and the big city life! When we return, we will use what we learned to develop fantastic exhibits, resources, and artworks that will help the public consider and understand one of the most critical environmental issues facing San Angelo, Texas and the world: water quality and scarcity! Aqua Squad will be making posts throughout the week, but for now, here’s a quick look at the itinerary. 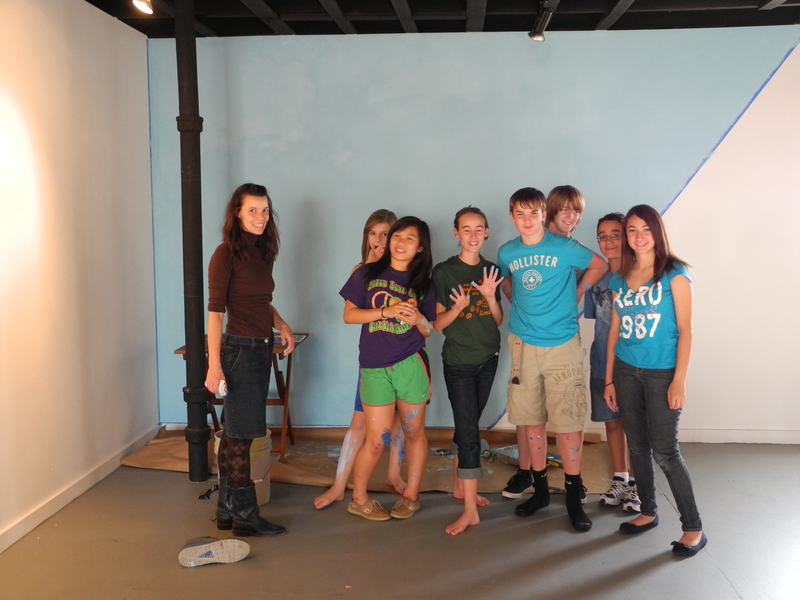 Aqua Squad will spend a whole day working with Director Ted Beattie brainstorming ideas for exhibition design. We’ll also be learning how to take complicated scientific concepts and present them to the public in a way that is engaging, emotional, and easy to understand. AND they have penguins, so we’ll probably learn a lot from those guys, too. 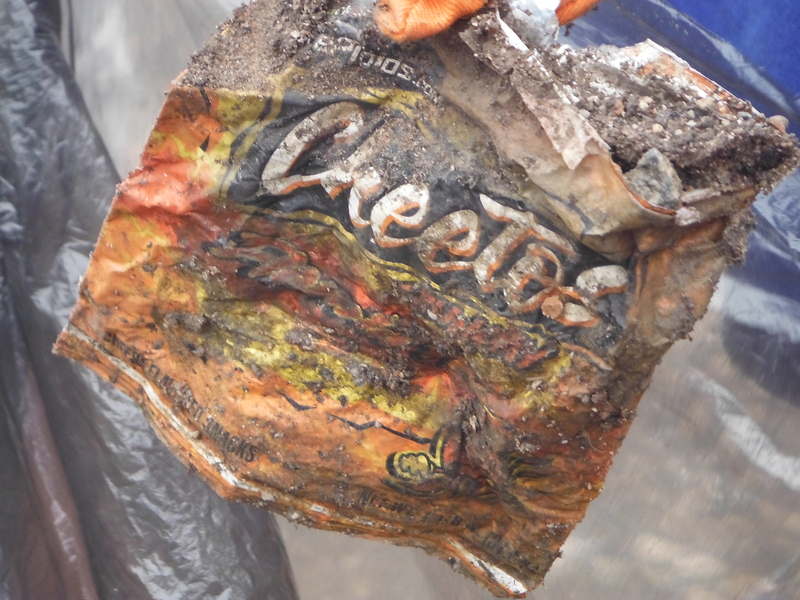 Contemporary artists often have a knack for using unexpected materials, arresting imagery, and interactive spaces to get the public thinking and talking about important issues facing our world (including pressing environmental issues). Exploring the MCA collection will no doubt inspire us to create some truly innovative projects to get the public thinking about water. The Art Nerds in the group are also very excited about this exhibition: Pandora’s Box: Joseph Cornell Unlocks the MCA Collection. Okay, so Sears isn’t actually headquartered there and technically it’s not the Sears Tower anymore, but that doesn’t change the fact that this skyscraper offers a great view of Lake Michigan. The Great Lakes hold 21% of the world’s fresh surface water, and we’re excited to see and study one of them. Gaining new perspectives and reaching new heights? We’ll definitely be checking that off our lists! gaining some national attention for our creative approach to interdisciplinary learning and collaboration. Check out our profile here: IMLS June Profile. 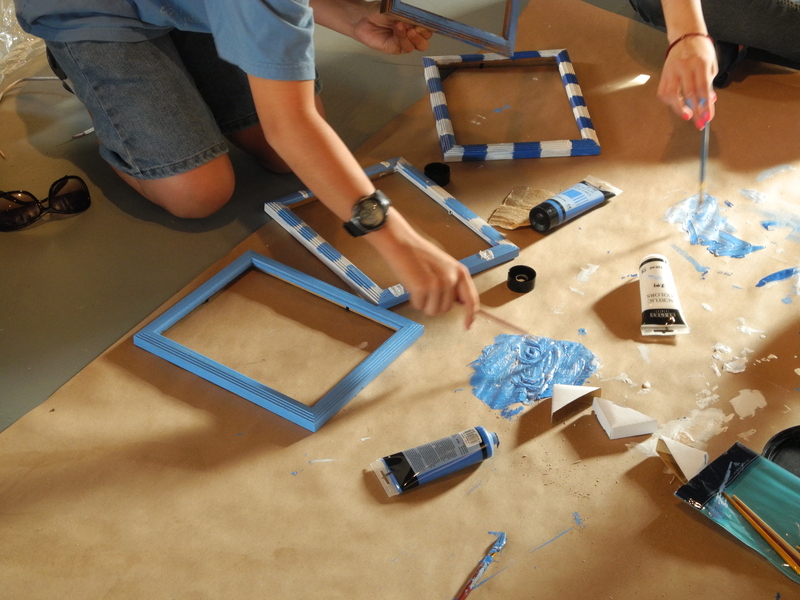 Please keep visiting the blog to keep up with our summer programs Aqua Squad and Camp Odyssey. We will feature posts from students, SAISD educators, and other special guests in the next few months. Learning is a fantastic journey, you should join us! 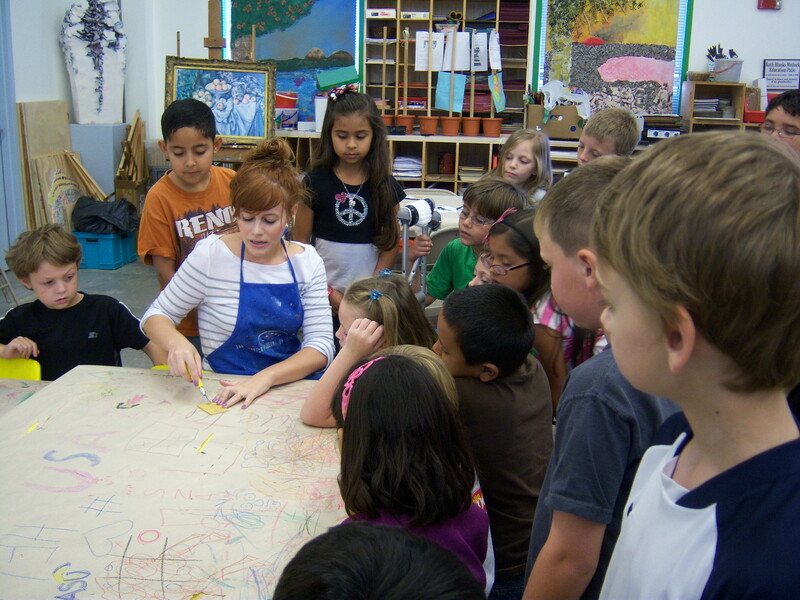 Here’s a nice little entry I found about talking with kids about art. Hint: It could work for adults, too! 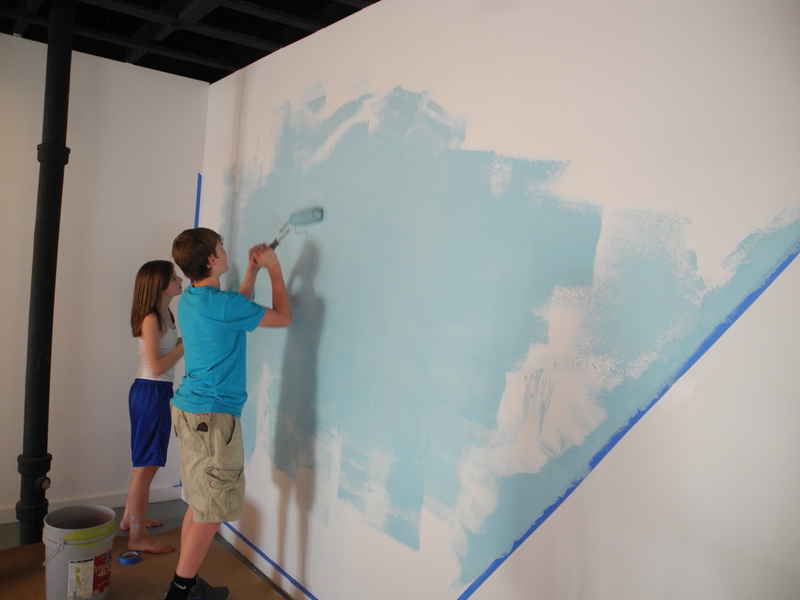 You can always try it in our galleries here at SAMFA over the summer! Thanks for being such a great group of 2nd graders! Here’s a special message from the staff at the Center for Creative Energy! Have a safe and fun summer, everyone! 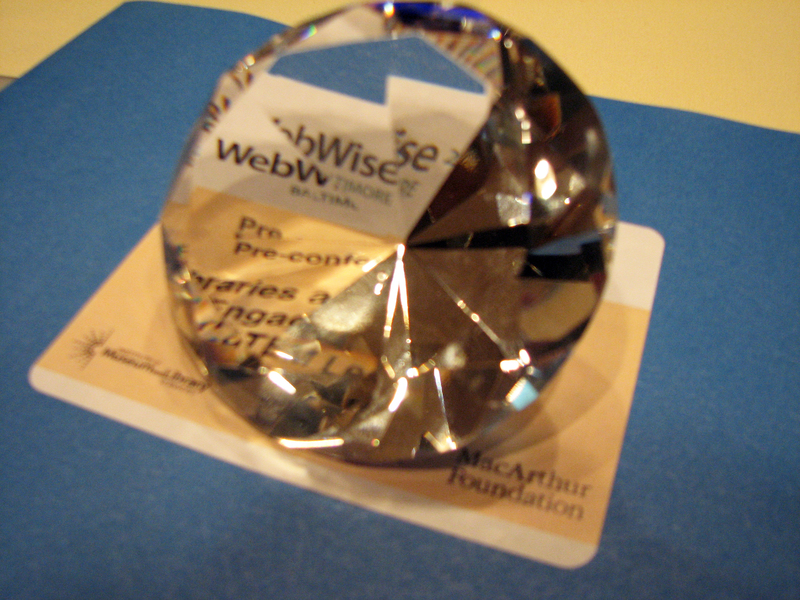 Last month, March 9th -11th, I was fortunate to be able to attend the IMLS sponsored WebWise conference in Baltimore, Maryland. A signature initiative of the Institute of Museum and Library Services, the WebWise Conference annually brings together representatives of museums, libraries, archives, systems science, education, and other fields to explore the many opportunities made possible by digital technologies. 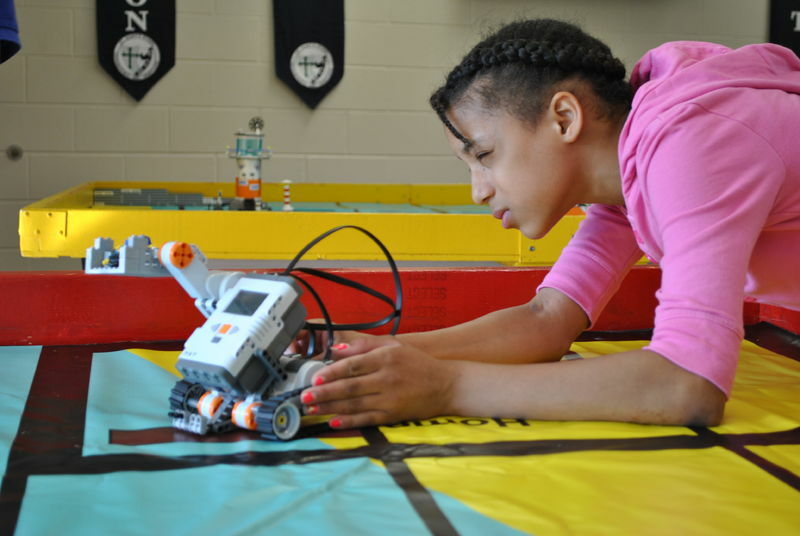 The focal topic this year was Science, Technology, Engineering + Math (STEM) in Education, Learning, and Research. I was amazed by the variety of projects related to STEM learning happening around the country. I particularly enjoyed hearing Dr. Milton Chen speak. 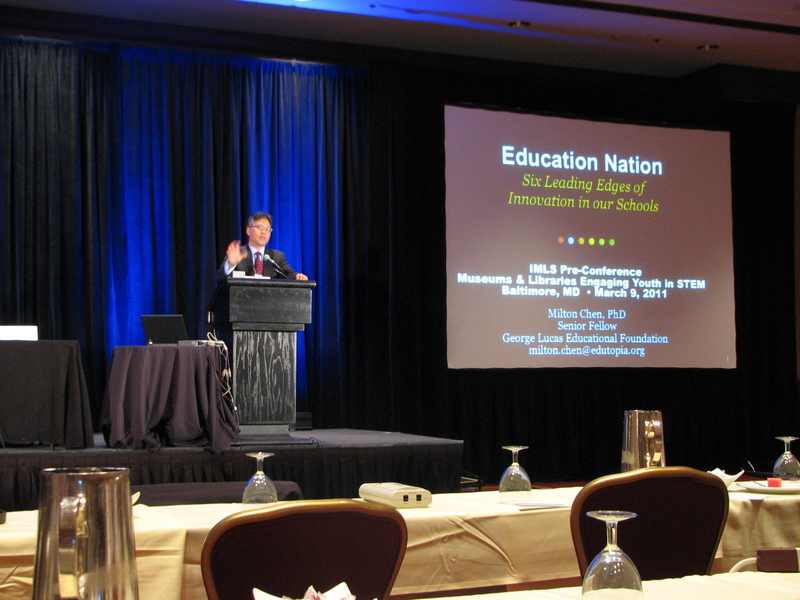 Dr. Chen is the former executive director, now senior fellow, with the George Lucas Foundation and Edutopia. Dr. Chen reflected on President Obama’s “Educate to Innovate” campaign to improve the participation and performance of America’s students in science, technology, engineering, and mathematics (STEM). This campaign includes not only efforts sponsored by the Federal Government but also those promoted by leading companies, foundations, non-profits, and science and engineering societies. 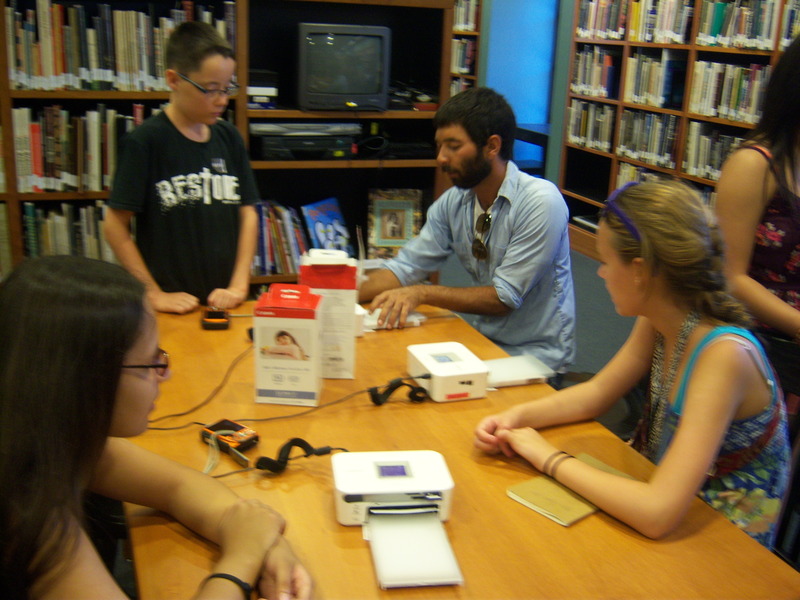 Libraries and museums are leading partners in this national effort, making significant contributions to both formal education and informal learning in the STEM disciplines. 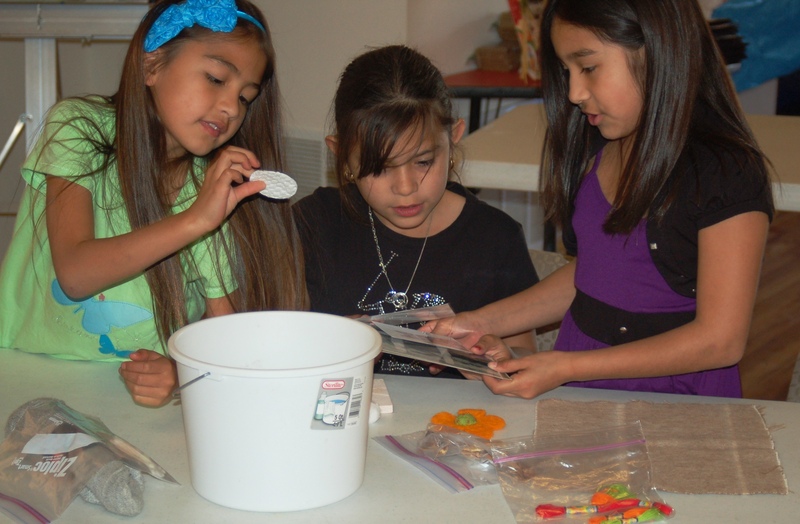 A significant trend in library- and museum-sponsored informal learning, especially in STEM-related fields, has been the support of social constructivist activities where youth learn through group investigation and creation. Dr. Chen also emphasized the the value of creativity and community involvement in STEM education. Additionally, I found the session Friday morning to be very relevant to our work here at SAMFA. Speakers friday talked about STEM, Arts and Humanities: Intersections and Inspiration. Essentially, what moderator Tom Scheinfeldt and panelists Chris Wildrick, Fred Gibbsand Michael Benson discussed was that years of Science and Technology Studies have exposed the STEM disciplines not as disembodied fonts on knowledge but as deeply social and cultural processes. Just as society at large is influenced by the insights and inventions of scientists and engineers, those insights and inventions are shaped by the influence of culture. In recent years, museum and library professionals and scienists alike have come to embrace the complex symbiotic relationship between science and culture to the benefit of both groups’ work. They highlighted examples of crossover projects that have brought librarians, museum professionals, humanists, artists, scientists, and engineers together to explore the productive tensions between science, technology, society, and culture. I strongly urge you to explore the content from this conference. There are brilliant minds and content that await you! Lillian and I just returned from the National Art Education Association national convention in Seattle, Washington. While there we shared Art/Science Fusion with museum and school educators from around the nation, and came home feeling confident that this program is aligning positively with the national conversation about education. There were lots of discussions about collaboration, making interdisciplinary connections in our curriculum, and about what skills young learners will need as they progress into the 21st century. What was most apparent to me is that educators have to keep pushing at boundaries and barriers in order to make real progress in education. Below are some inspiring highlights from our trip. Neukon Vivarium, an installation located in the middle of Seattle, is a dead Hemlock tree sustaining an entire ecosystem as if it had been left in the forest to decay. The work is stunning in the middle of the city, as is the immense effort it takes fo r humans to recreate the conditions necessary for this natural process to happen in an urban area. 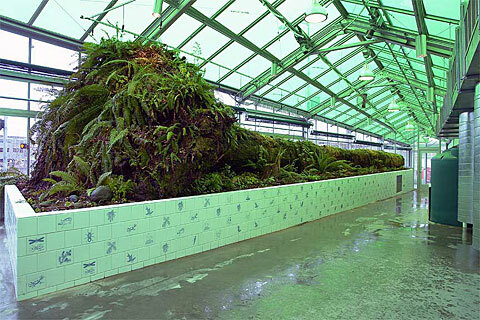 The ecosystem in this artificial space thrives because it is constantly cared for by a staff in totally stable conditions within a custom built greenhouse. Think of how the earth could continue to thrive if we cared for it as carefully as this work (which happens to be part of the collection at the Seattle Art Museum)! Think of how the earth might thrive if we simply left it alone. Are either of these options a possibility? What role do humans play in sustaining and destroying the environment? What is our place in nature? These questions are important points of departure for our programs at the Center for Creative Energy. With techn ology, digital media, and science changing rapidly it becomes more pressing everyday to ensure that students are coming away from their school years as adaptable, creative, and critical thinking citizens. A vast number of educators have expressed their concerns with No Child Left Behind and the emphasis that legislation places upon standardized testing at the expense of meaningful learning. As that legislation comes up for re-authorization educators must be prepared to articulate what we envision education to be, and what policies will best help us to make those visions a reality. How could we help children develop creativity, critical thinking, communication, and collaboration skills through our curriculum? How would doing so change the way we approach curriculum design? These are just some of the questions that were floating around in my mind as I wandered Puget Sound. Now that I am back in San Angelo, it’s time put these questions to work by developing quality programs for our students. In the next few weeks we’ll be focusing more on education policy, as well as keeping you updated with what’s happening with Art/Science Fusion! As always, comments, new ideas, and suggestions are welcome. You may be wondering about the conversations and motivations for developing the Center for Creative Energy and its associated programs. While Megan DiRienzo has written about the Museum’s local motivations, I would like to introduce a few of the larger conversations that continue to be influential in the development of our work and its context in the U.S. education conversation. Here’s a quick introduction to STEM and STEAM, and next time I’ll expand on their direct relevance to the Center for Creative Energy. Nationally, many educational institutions, research organizations and foundations responded to the alarming reports of U.S. students’ declining performance in STEM subjects when compared to international students by re-evaluating curriculum and programming for its ability to reinforce deeper and more meaningful STEM learning. For the unacquainted, the acronym STEM stands for science, technology, engineering, and mathematics. According to both the United States National Research Council and the National Science Foundation, the fields are collectively considered core technological underpinnings of an advanced society. In both political and academic forums the strength of the STEM workforce is viewed as an indicator of a nation’s ability to sustain itself. Most recently, President Obama launched the Educate to Innovate initiative to support STEM education in K-12 schools. upended by a 2008 study from the National Endowment for the Arts, “Artists in the Workforce,” This study showed that artists make up a larger occupational group than lawyers, medical doctors, or agricultural workers. The size of the artistic community gives it an astonishing $70 billion aggregate annual income. The country’s $316 billion communication and entertainment business employs a diverse range of artists, most of whom prepared for their careers by participating in some sort of arts education program. This massive economic contribution to the U.S. economy alone should provide the case for support of arts education, argued Piro. The STEM/STEAM conversation has motivated our thinking and curriculum approaches to the Center for Creative Energy. The conversation (and debate) continues amongst politicians, educators and other stakeholders. In my next post, I will share more about the converging paths of STEM and STEAM. 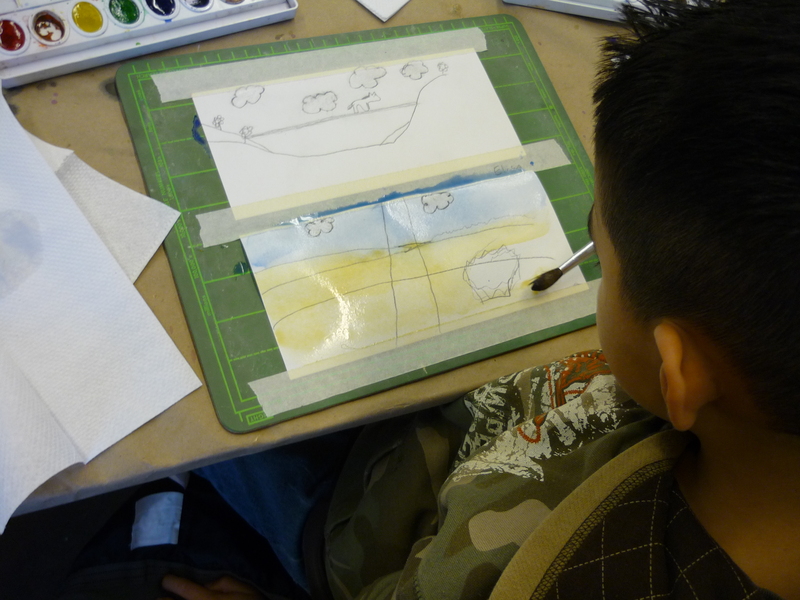 This week, many of our Art/Science Fusion 2nd graders put the finishing touches on their landscapes. 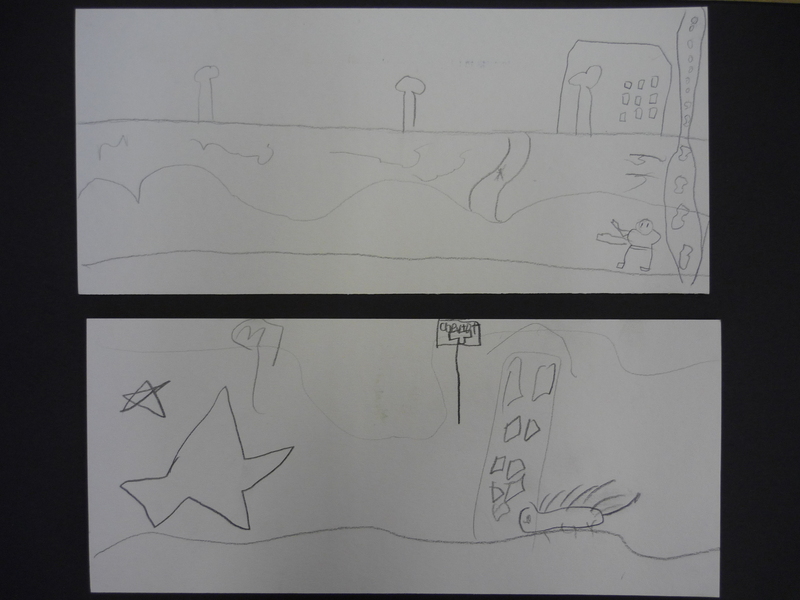 The children spent three weeks on their artworks. 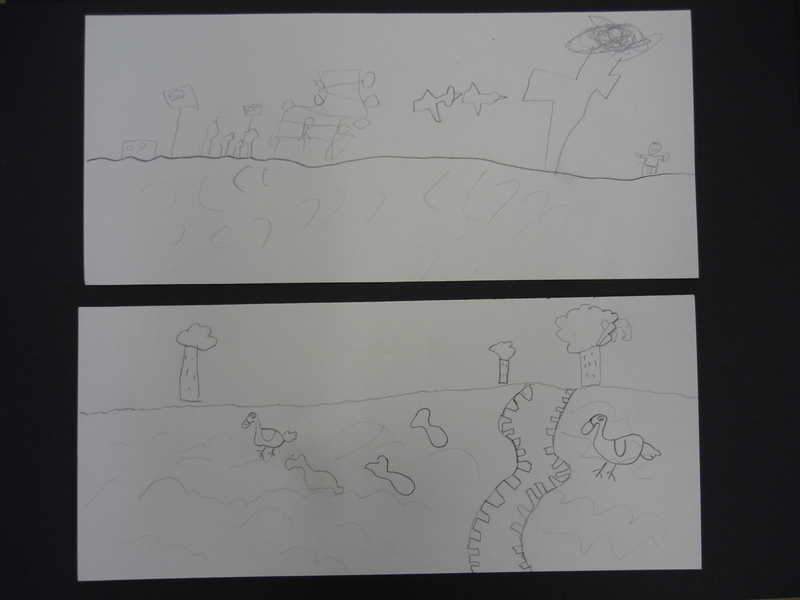 During the first week, they completed pencil sketches of their landscapes. The next week they masked off everything they wanted white, and laid out broad washes of color. During their final week in the studio, they added details with smaller brushes, speckled, and used sea salt to add texture. Watercolor artists will create quick watercolor paintings en plein air (a French phrase meaning in open air, which is most commonly associated with French Impressionists who, obsessed with light, loved to paint outdoors), or over time in the studio. Walt Davis, whose work the students looked at on their gallery tour, paints en plein air while traveling and creates larger works back home in his studio. 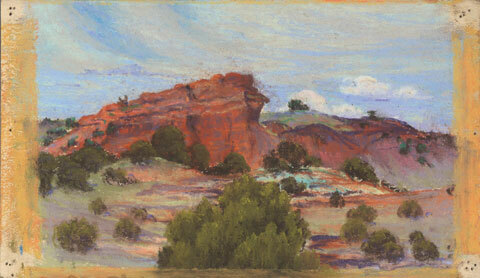 All of Josephine Oliver’s works were created en plein air during her trips to to west Texas in the 1920s and 1930s. If your students don’t remember these works, check out the All About Texas Tour Ppt. for a refresher! Here is a great video of an artist doing a watercolor sketch. Please feel free to share this with your students. Do they recognize any familiar techniques? San Angelo had a crazy snow/ice storm last week, so Art/Science Fusion readjusted scheduling to make sure that SAISD 2nd graders still get the most from the program. Christy and I (Meg) shared a couple of sessions, and it got me thinking about how important water is to this program. Laying down washes of color. 1. 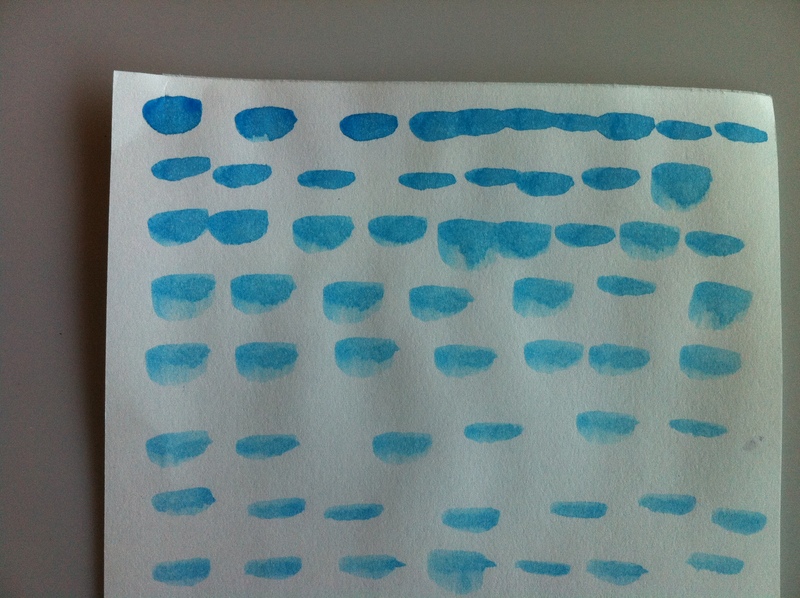 We’re using watercolor. Okay, a bit literal, I know…BUT Walt Davis, who is featured in the All About Texas exhibition at SAMFA, created beautiful watercolor paintings to document the journey he and his wife took around the edges of Texas. Our 2nd graders are learning some basic techniques like masking, washing, and dry brushing to create watercolor postcards of the Texas landscape. At the end of the program, the kids will exchange their postcards along with a letter sharing their thoughts about their time at the Museum and Water Education Center. Christy and students organizing Texas wildlife according to region. 2. We’re focusing on how water (in the form of rivers and an ocean basin) helps create the shape of Texas. This naturally leads to a great discussion about how ecologically diverse Texas is. Texas has 7 ecologically unique regions featuring deserts, swamps, canyons, prairies, and beaches. Why does Texas have such an awesome terrain? Because different amounts and kinds of water (salt vs. fresh) can create different ecosystems and landforms. Of course, Texas being really, really big helps a lot! 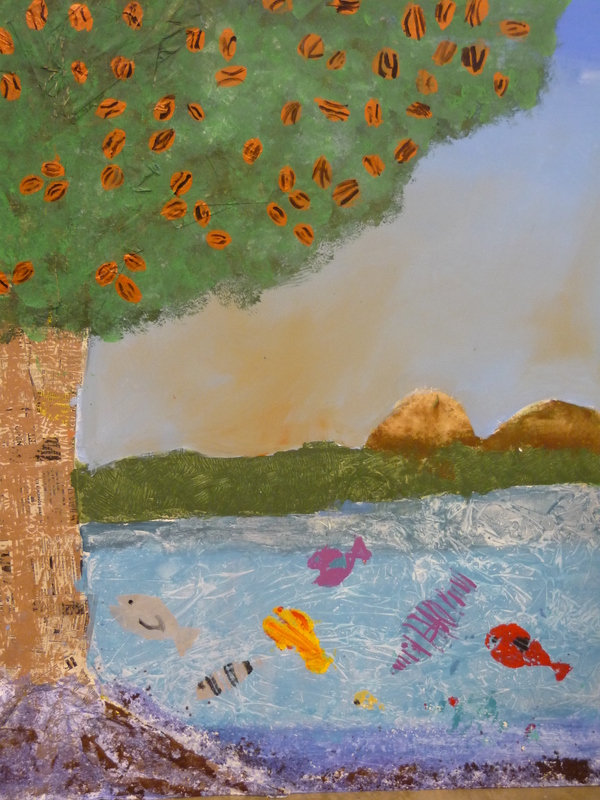 As we continue to teach this program, we hope that students are starting to think about the important role both water and art play in their lives. If you have a moment with your students, ask them why water is important. Then, feel free to share those responses in the comment section below. The first group of Art/Science second graders just got on the bus to return to Santa Rita Elementary School. I expected to feel exhausted, but I actually feel energized! Who knew that 3,000 + mile trip around Texas with 20 second graders could be so awesome? We took a “road trip” tour across the state of Texas in the All About Texas exhibition (don’t worry, we wore seat belts). To keep ourselves occupied on journey, we chatted about artist materials, scale, and what the weather might feel like if we able to step into one of Mary Baxter‘s beautiful oil paintings, or perhaps join Josephine Oliver on one of her fantastic summer art making trips. At the end of the tour, we did a little sketching of our own. 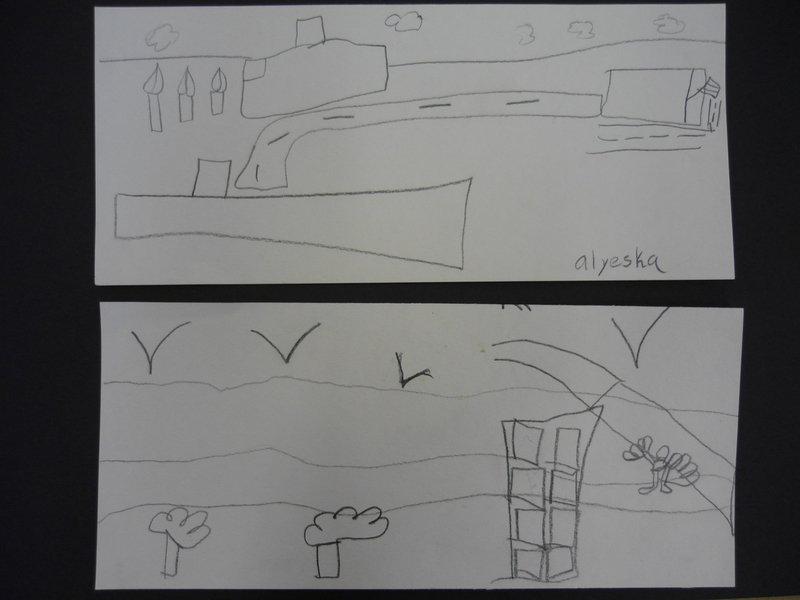 Below are some wonderful drawings the students created. 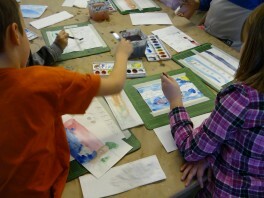 Later this month they will be adding color and detail using watercolor. In the top image, you can see SAMFA's director, Howard Taylor, showing some fellow museum folks around the grounds. Stay tuned for updates about on student progress. 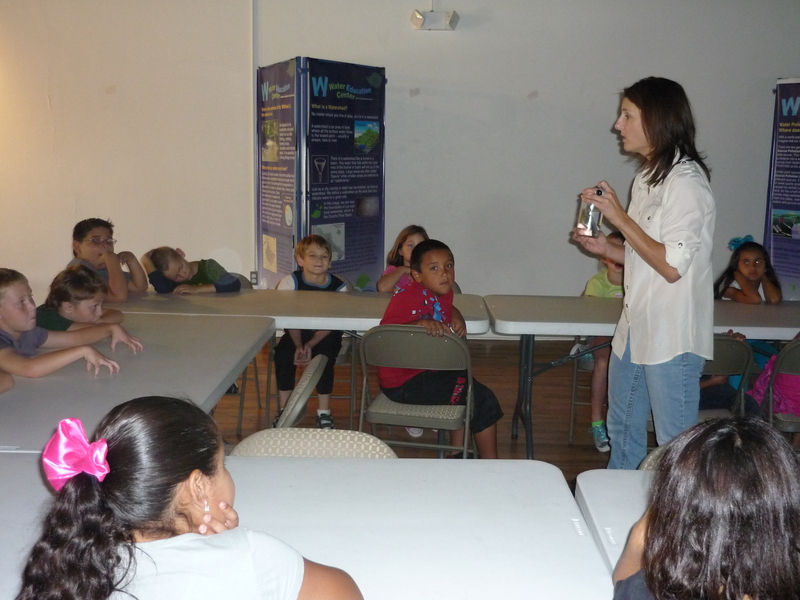 Next week the students will visit Ms. Christy at the Water Education Center to learn about the science that makes the Texas landscape unique! Welcome to the Center for Creative Energy! We are stationed in San Angelo, Texas on the banks of the Concho River prepared and excited to kick off a great year of Art and Science programming for San Angelo students. 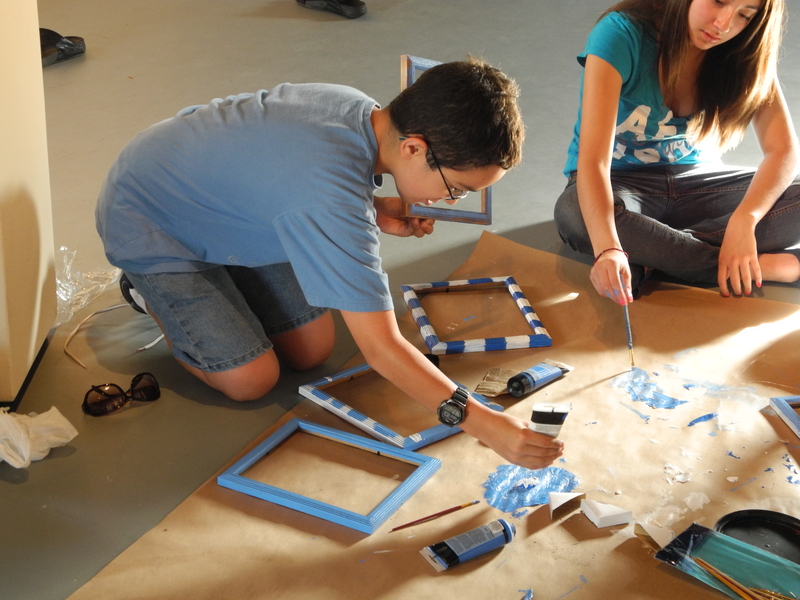 Monday is the first session of our Art/Science Fusion program. Santa Rita will tour the new All About Texas exhibition and experiment with some basic sketching techniques. Our staff will be updating this site as the 2011 Center for Creative Energy programs get underway. You can learn more about what the Center for Creative Energy offers in the About Us section. Be sure to visit later this week to see photos and updates about the tour! We’ll also be posting lesson plans, art/science musings, and entries from guest contributors as the year progresses.